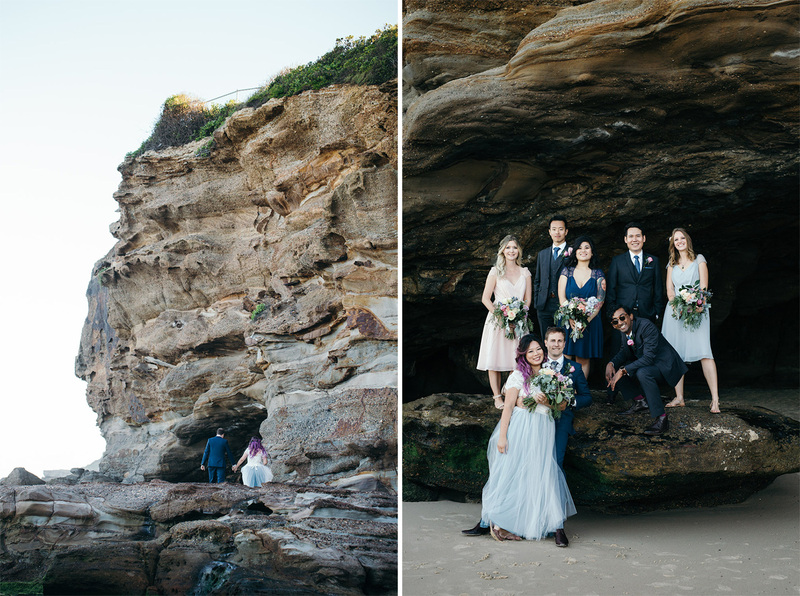 Caves Beach – unforgettable! 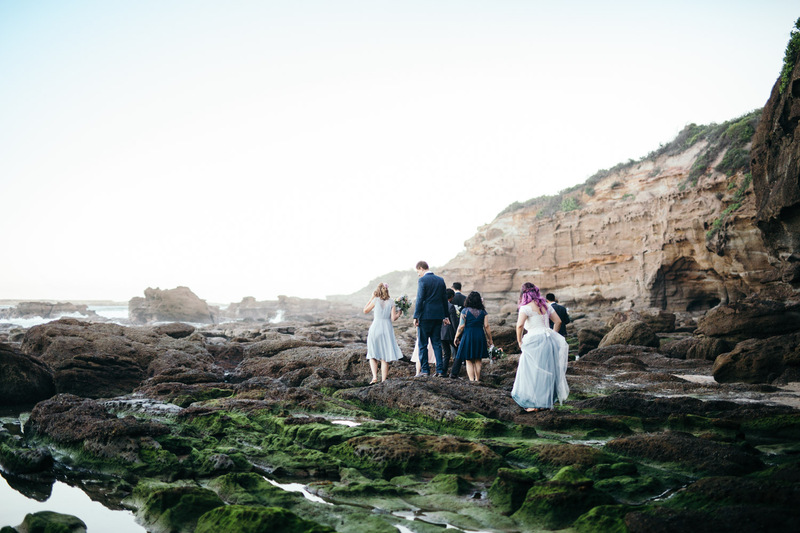 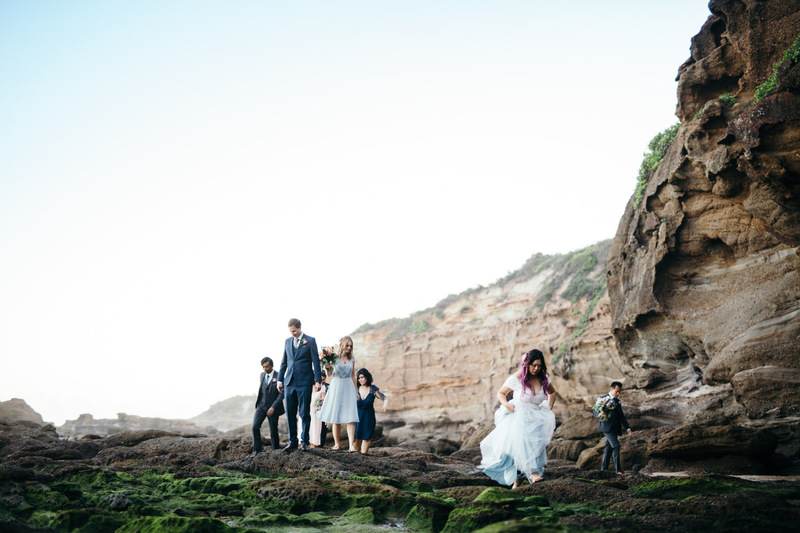 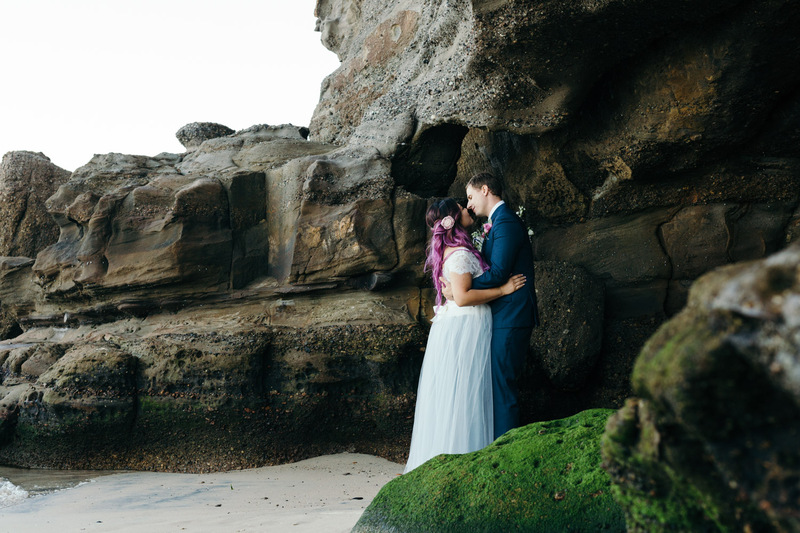 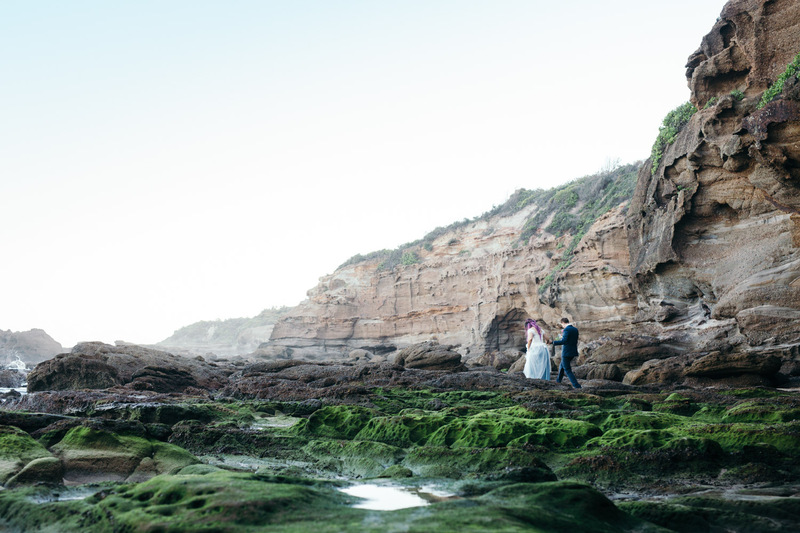 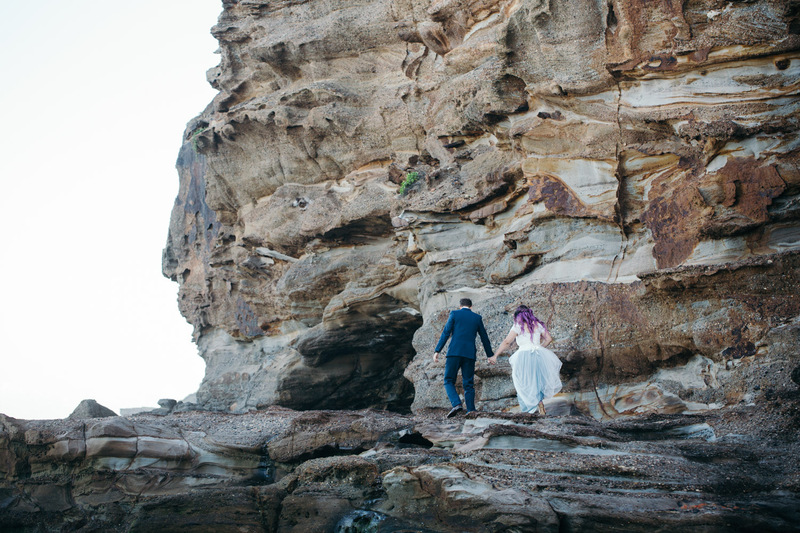 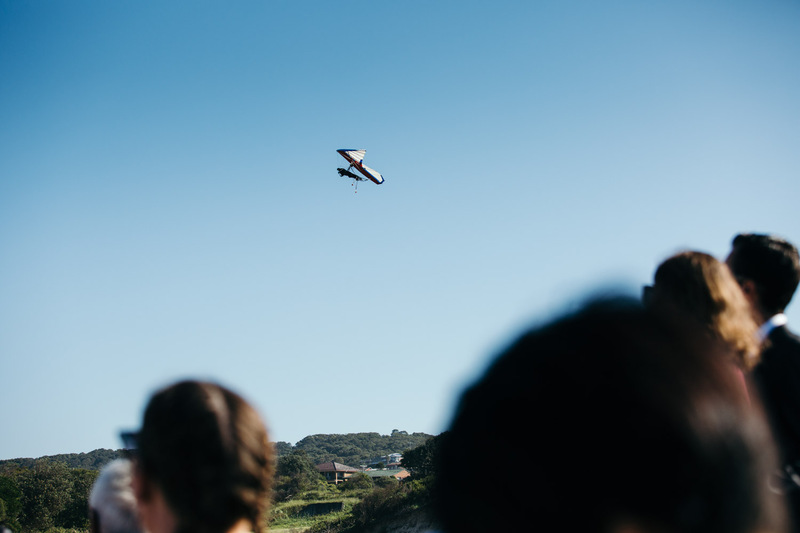 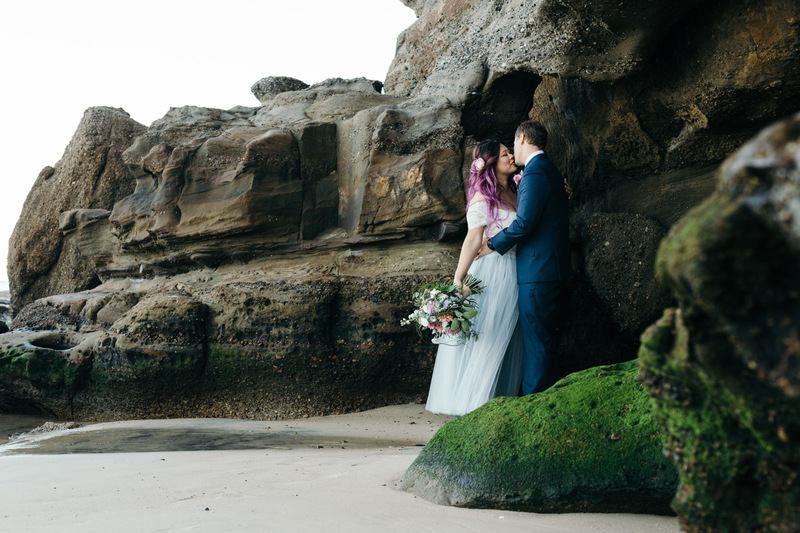 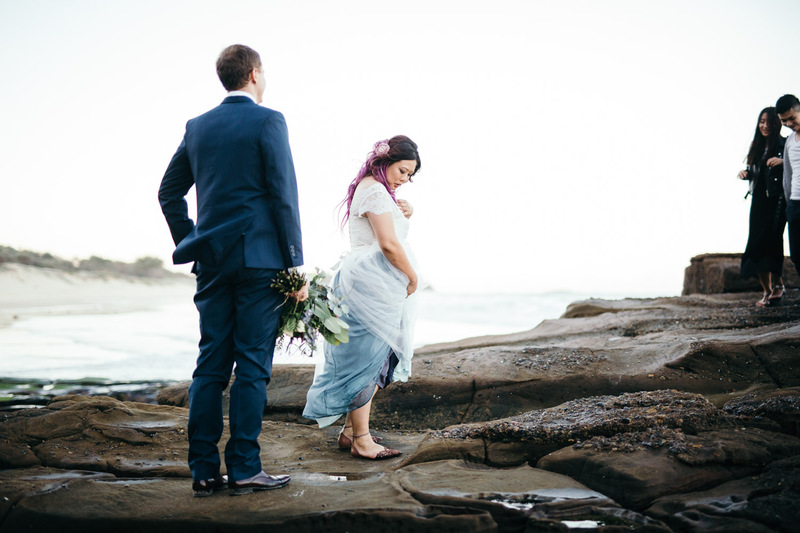 The day I drove up the Pacific Motorway to scout this location for Grace and Jules’ Caves Beach wedding was the day immediately fell in love with the place. 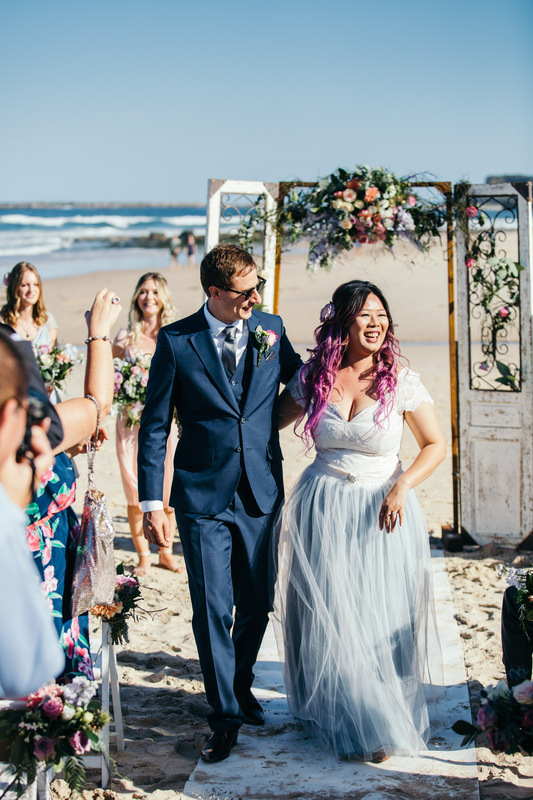 As you exit the M1 towards Lake Macquarie, follow the Pacific Highway northbound towards Catherine Hill Bay (Catherine Hill Bay was where I photographed Tanya + Ashley’s Engagement Session, linked here). 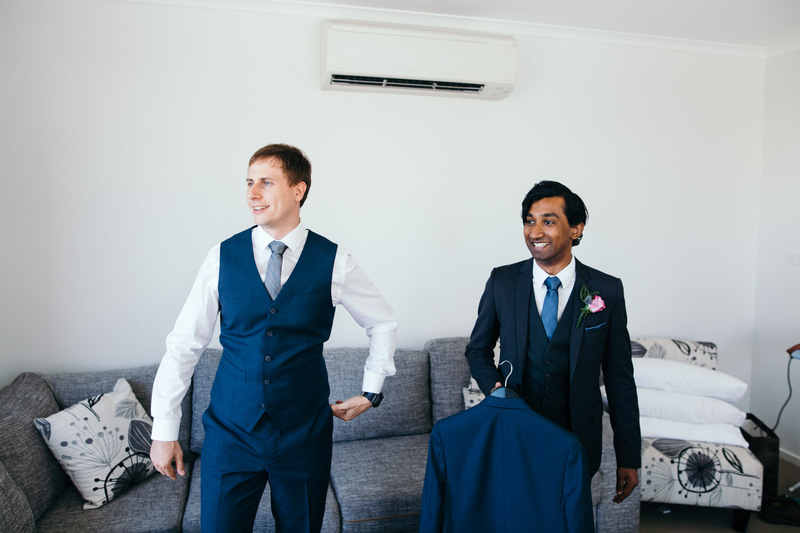 As you turn right to head down Bowman Street, the streetscape immediately changes to creamy white and royal blue weatherboard cottages enclosed by manicured low-rise garden beds. 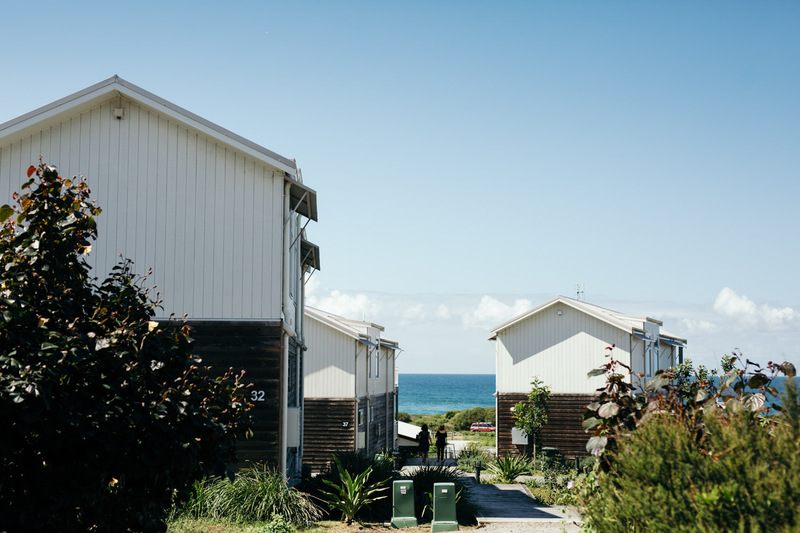 The streets are wide, with sand-draped gutters, blown from the nearby beach dunes. 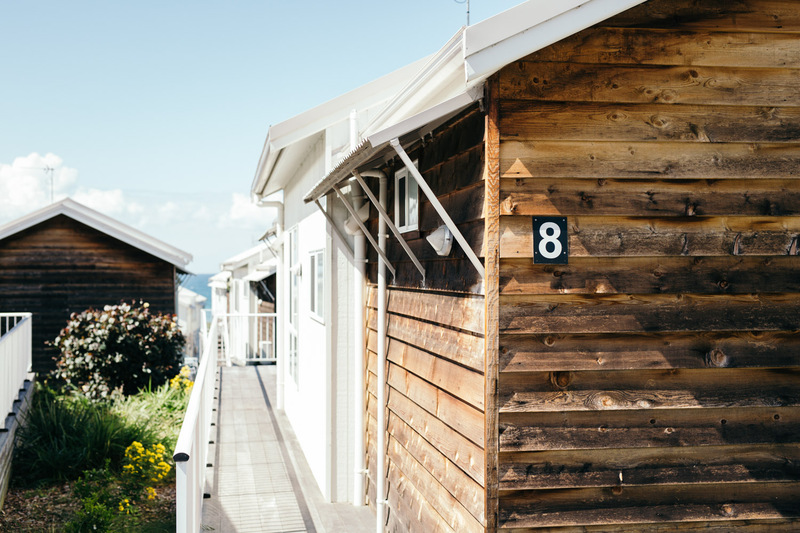 It’s no wonder the locals love it here – the area is so welcoming! 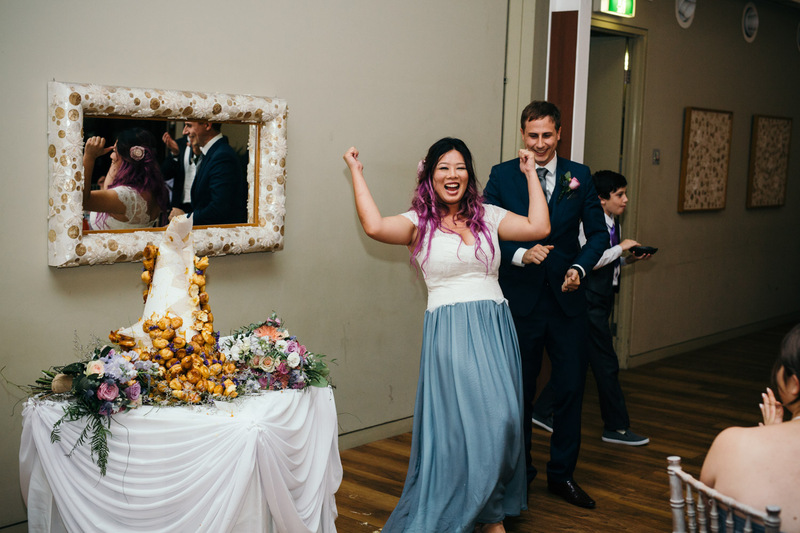 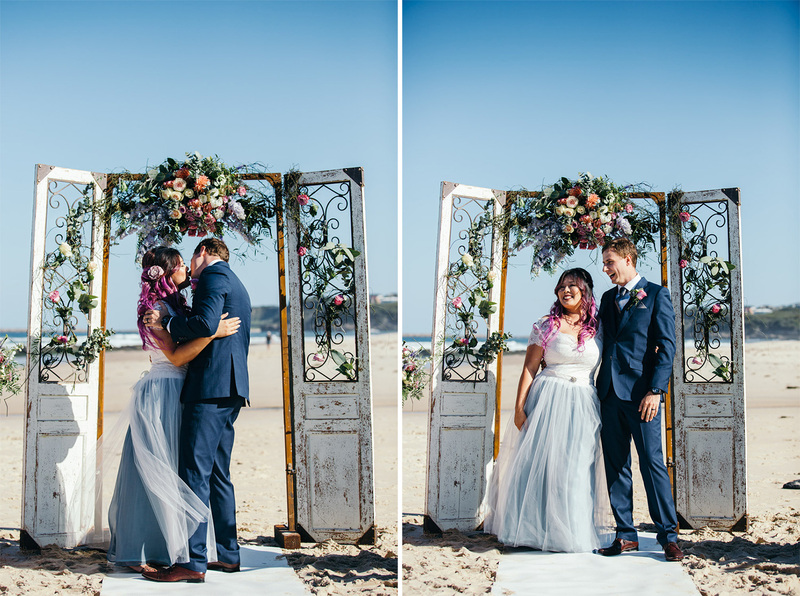 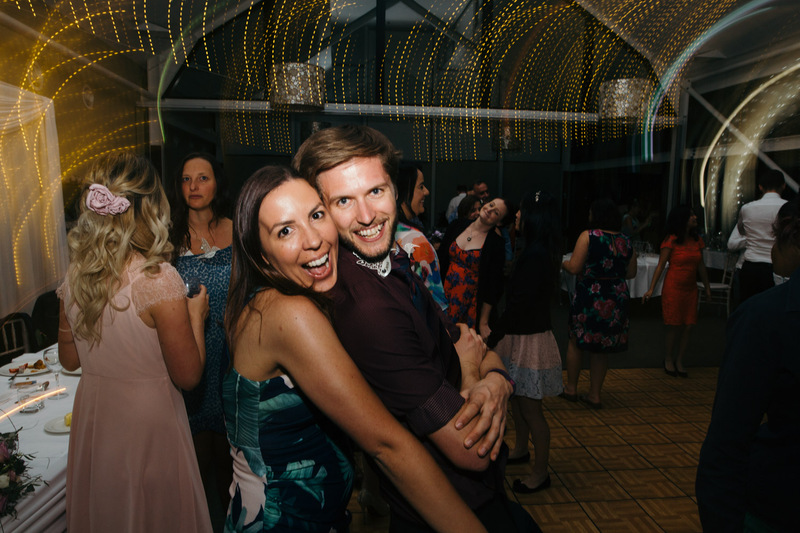 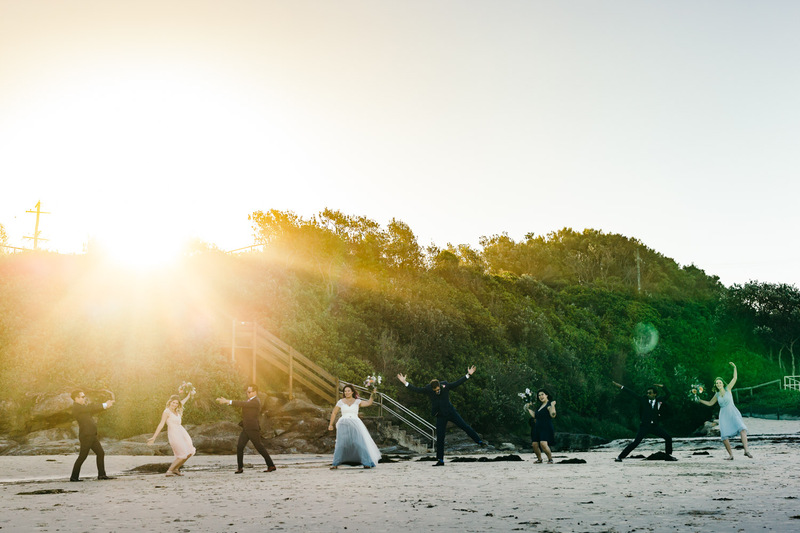 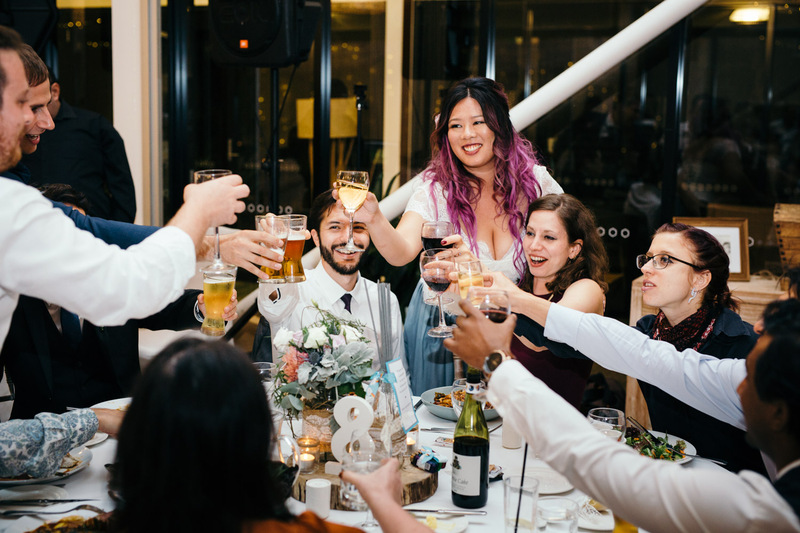 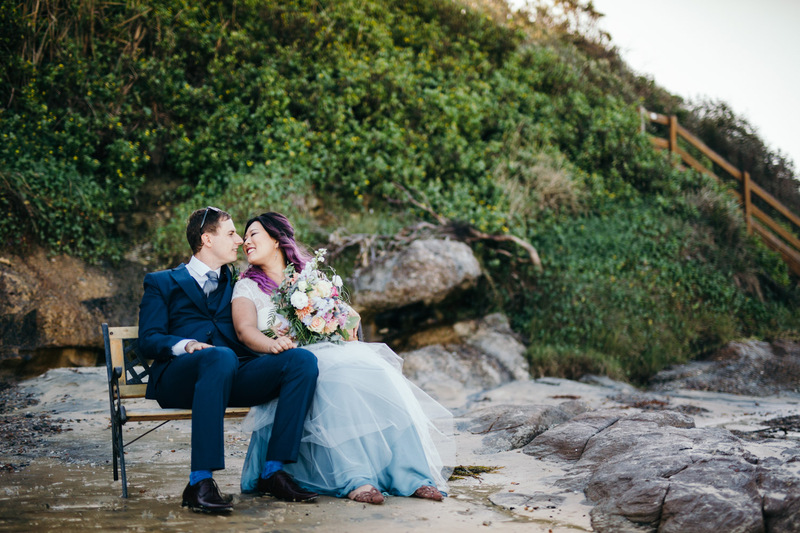 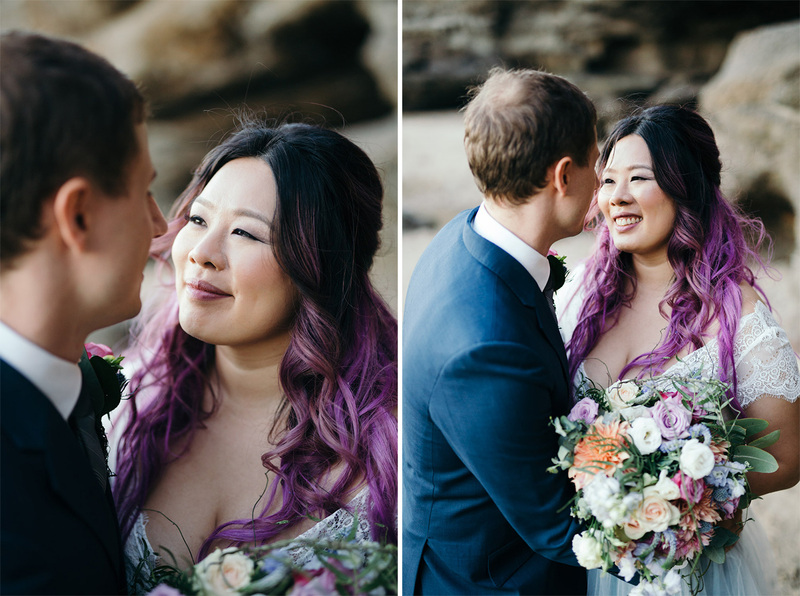 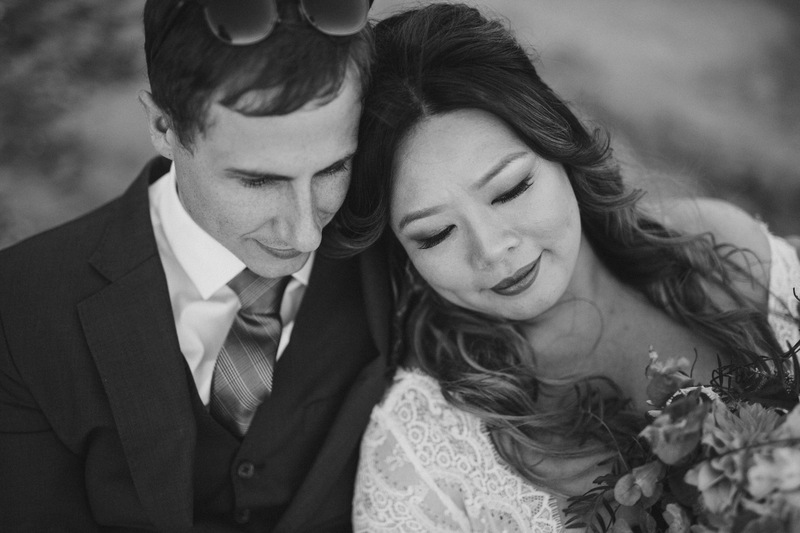 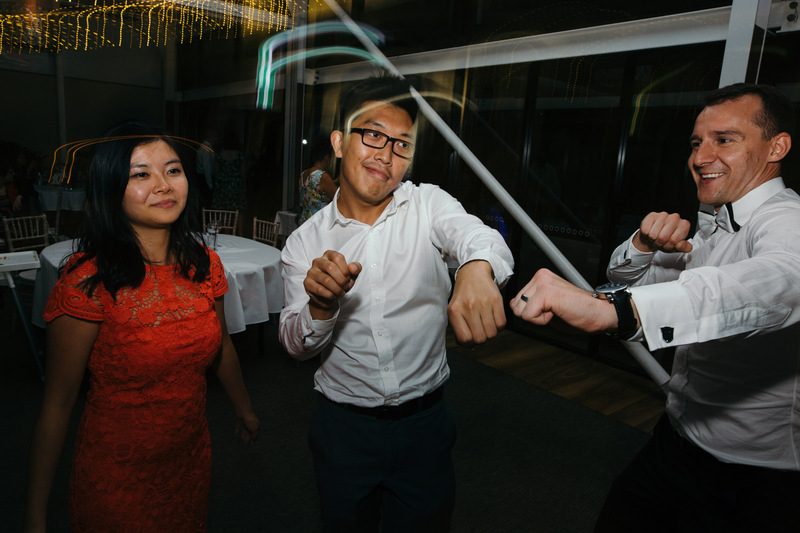 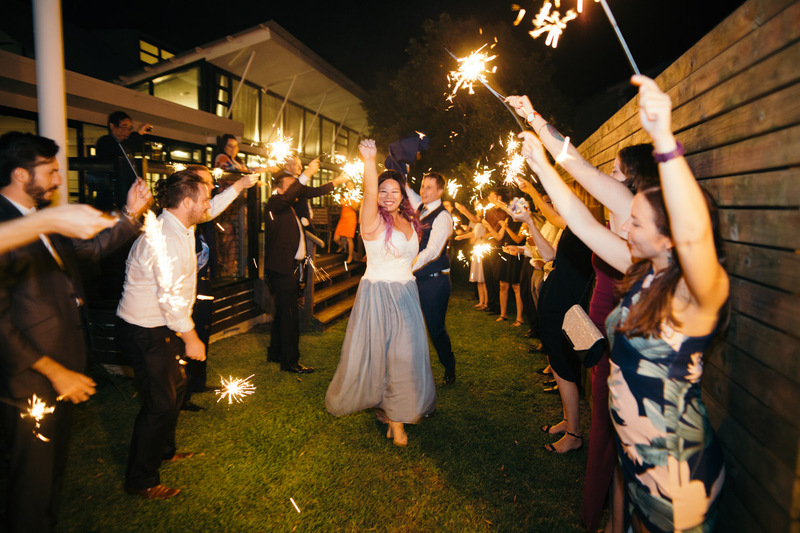 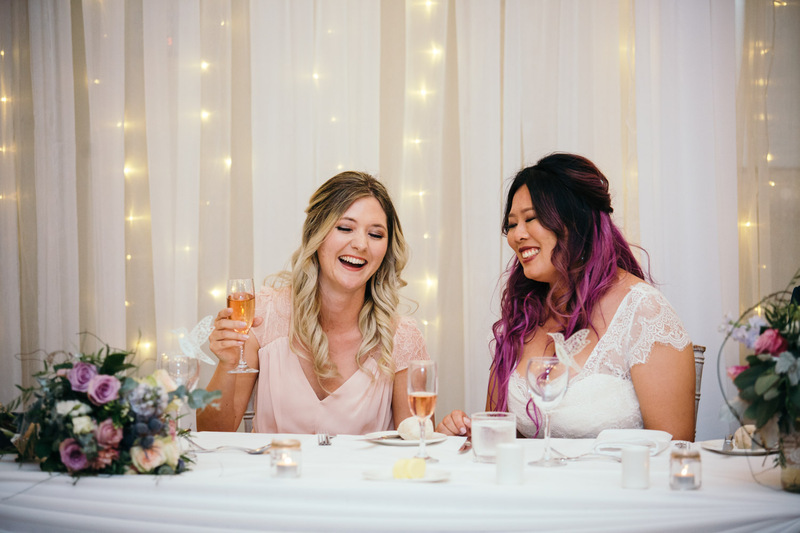 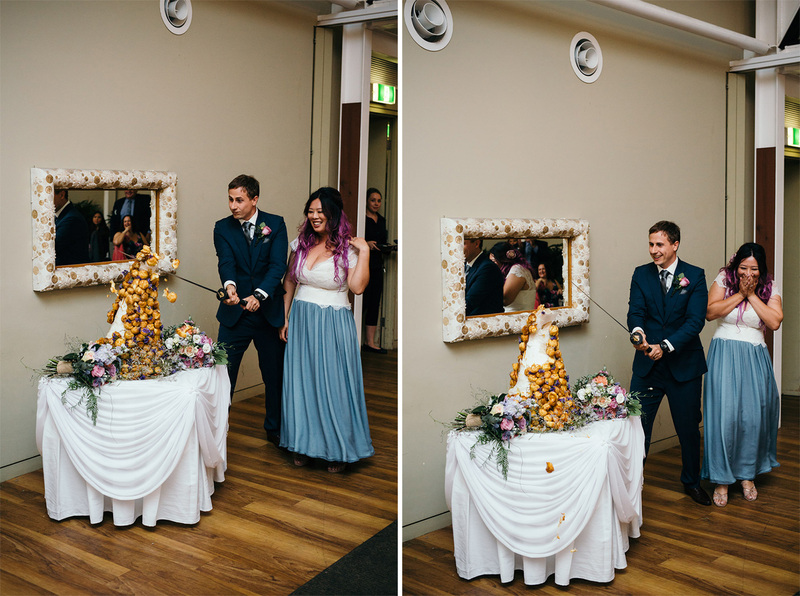 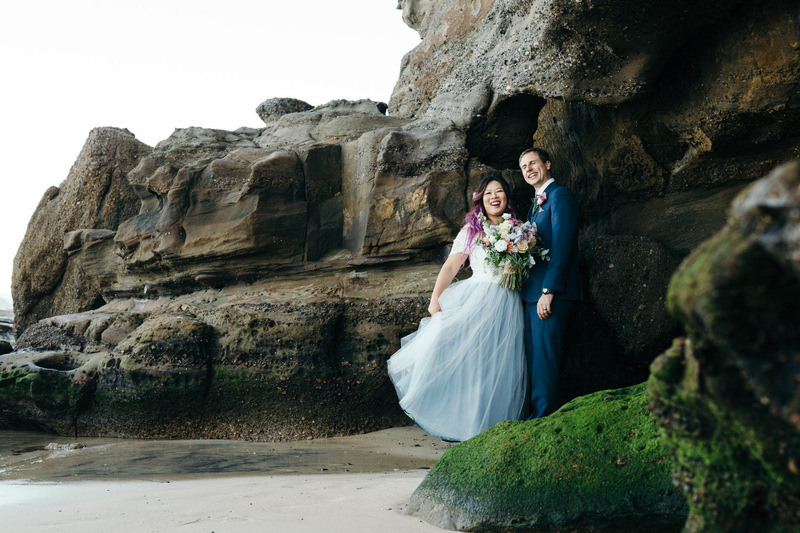 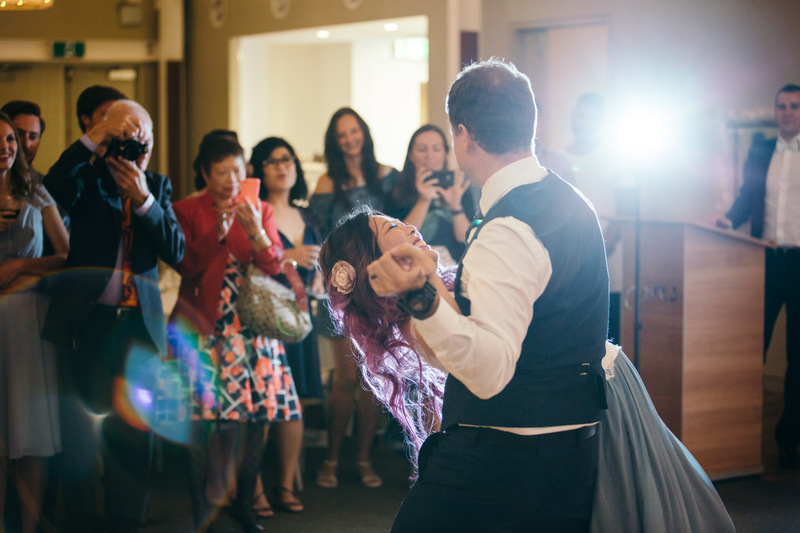 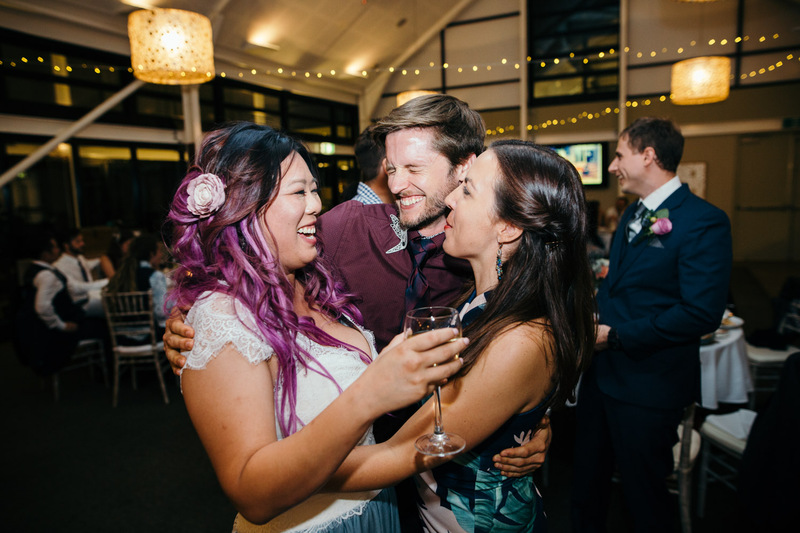 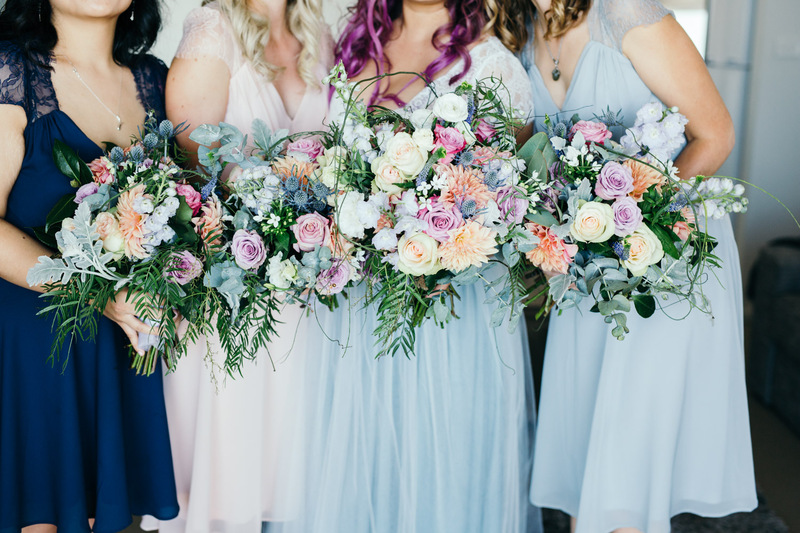 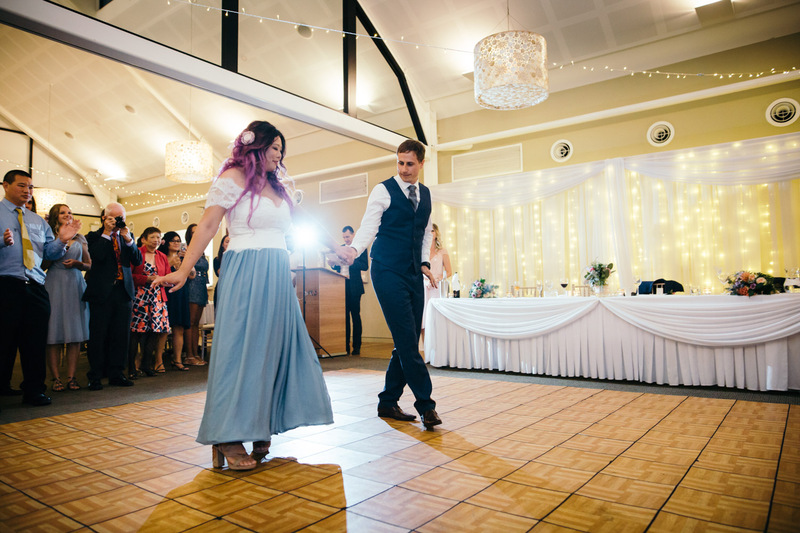 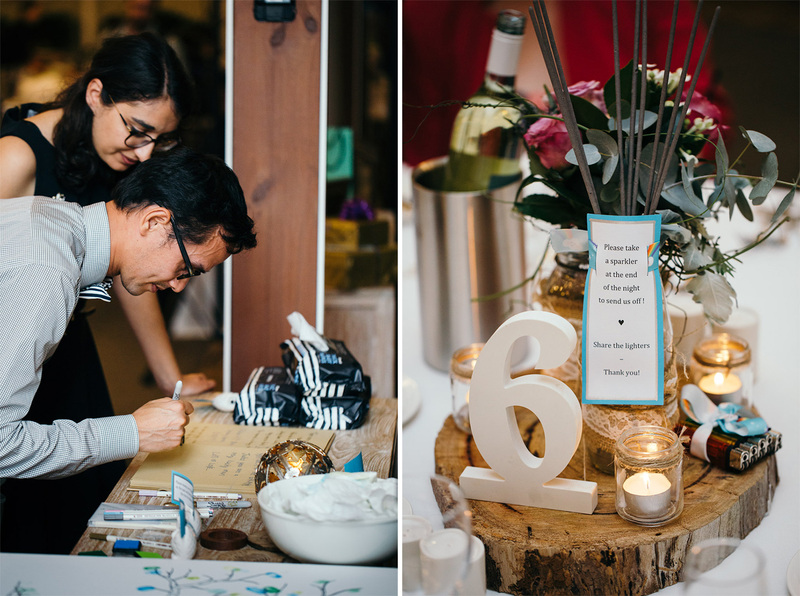 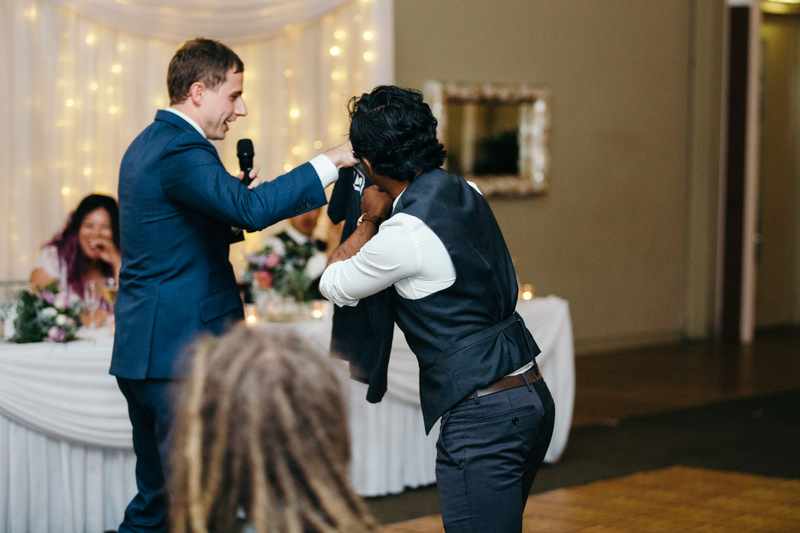 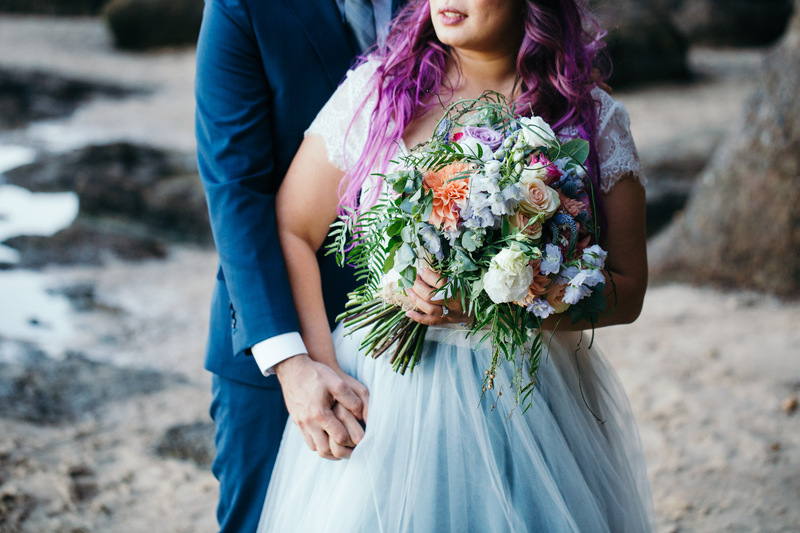 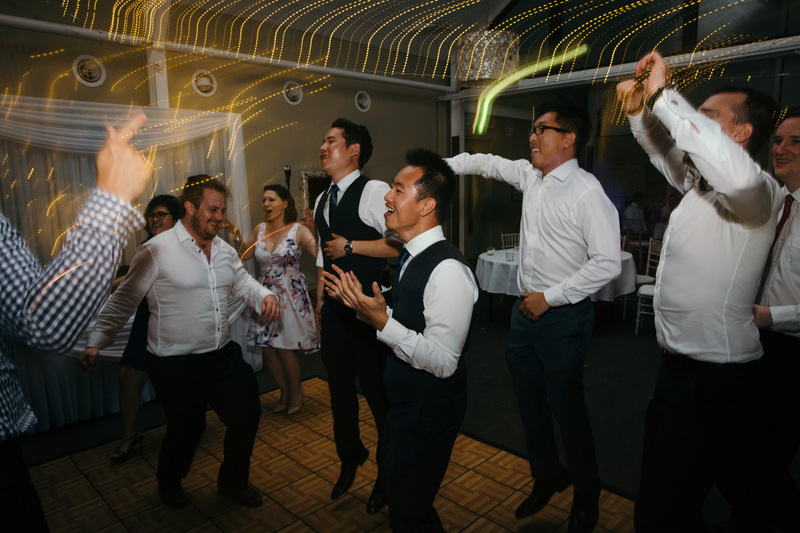 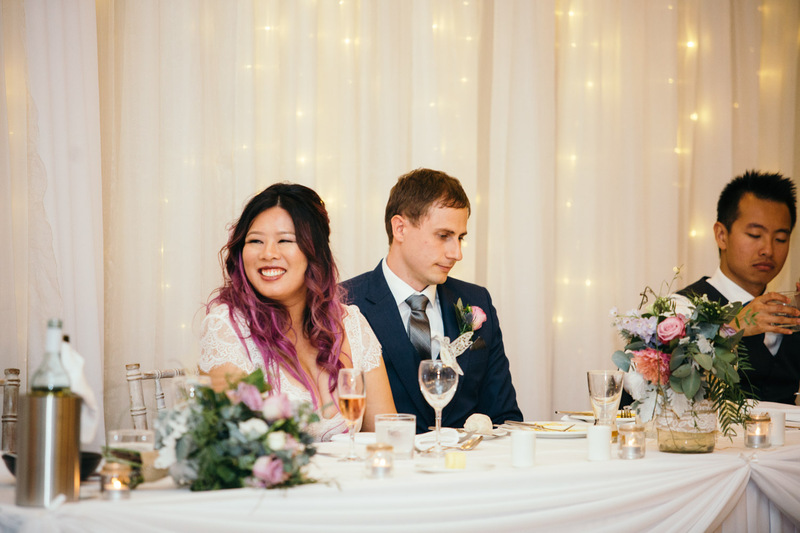 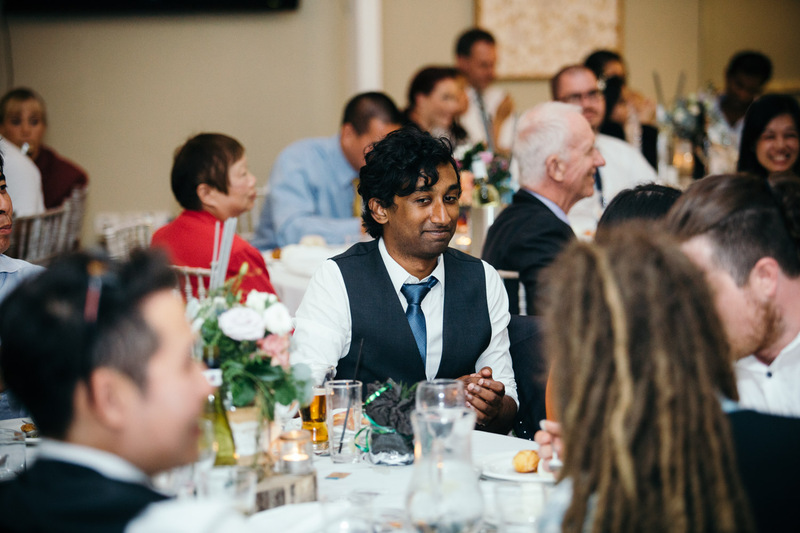 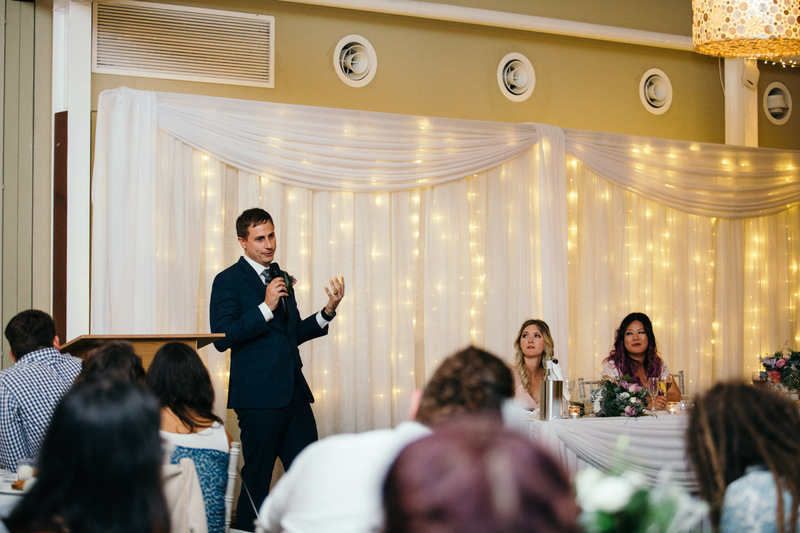 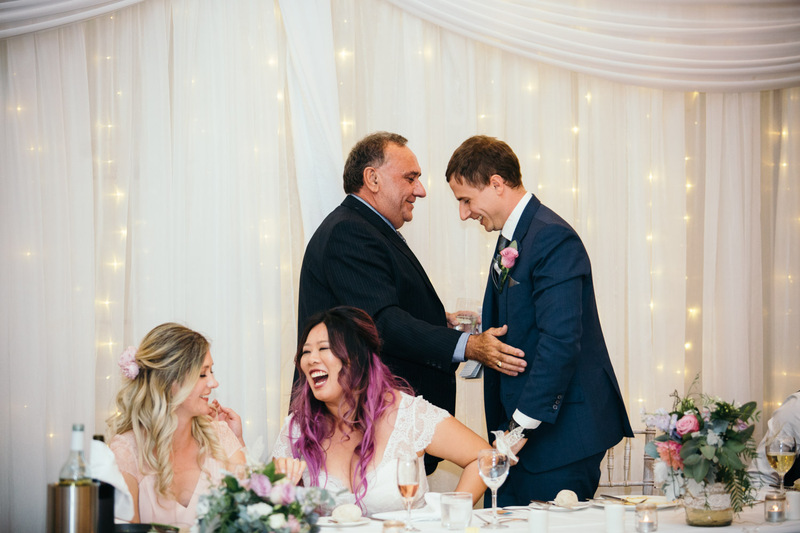 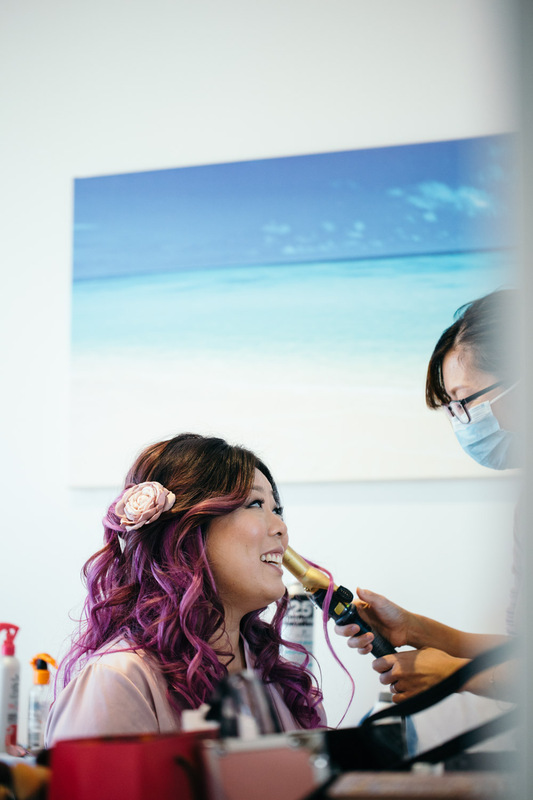 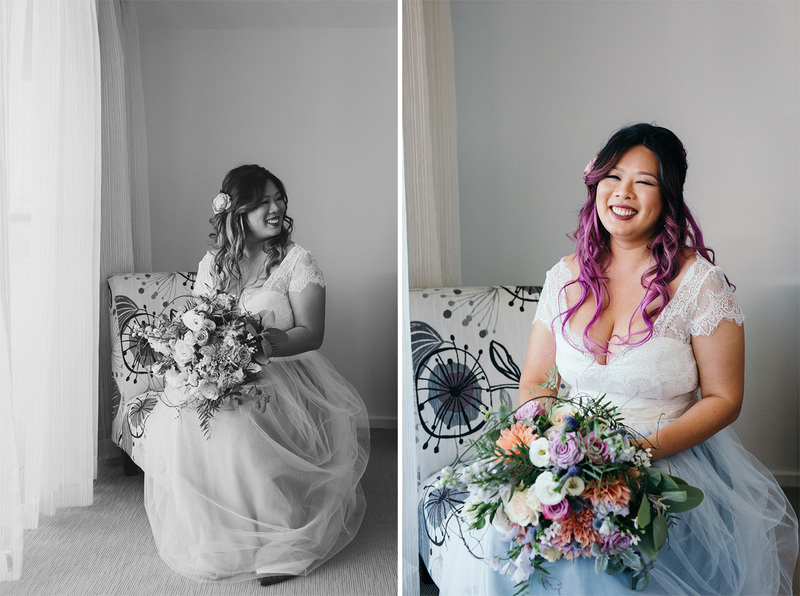 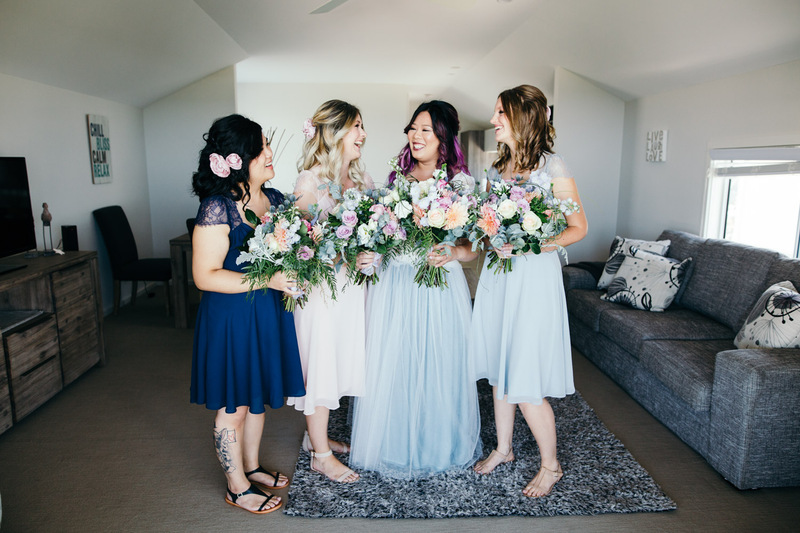 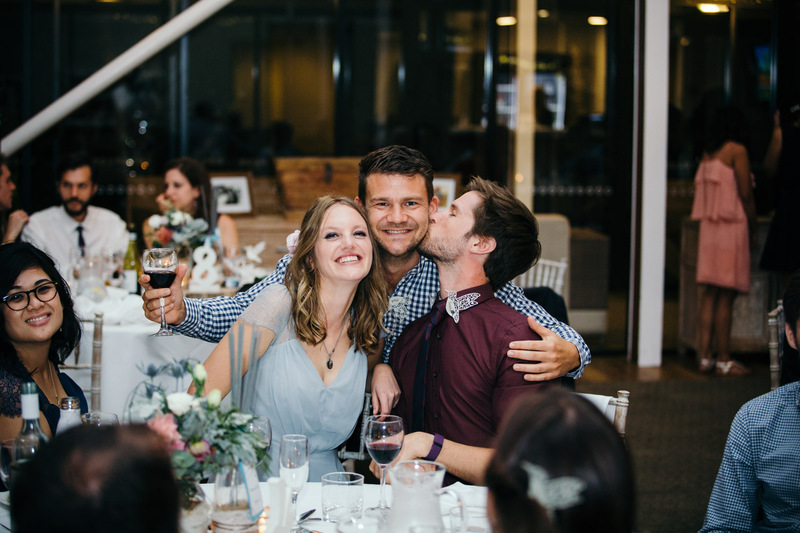 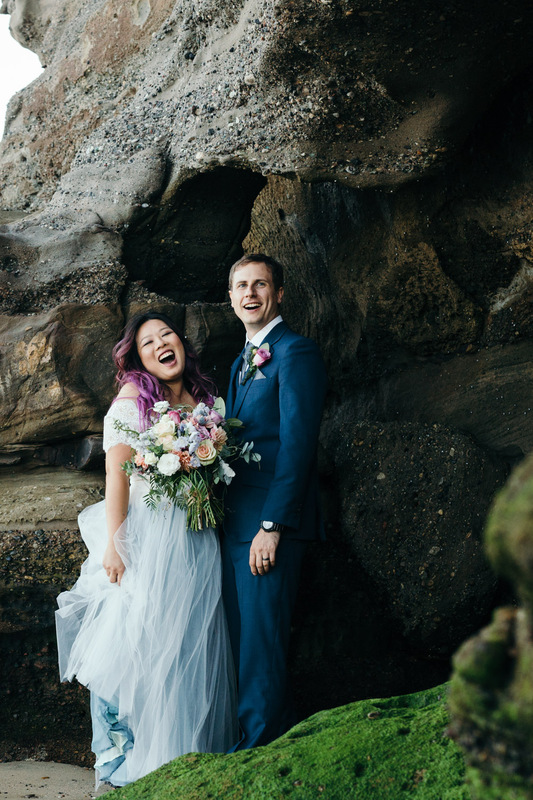 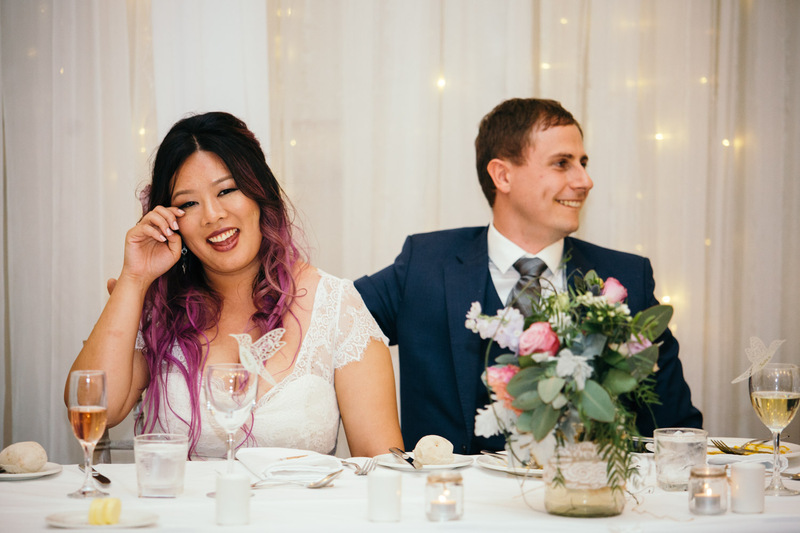 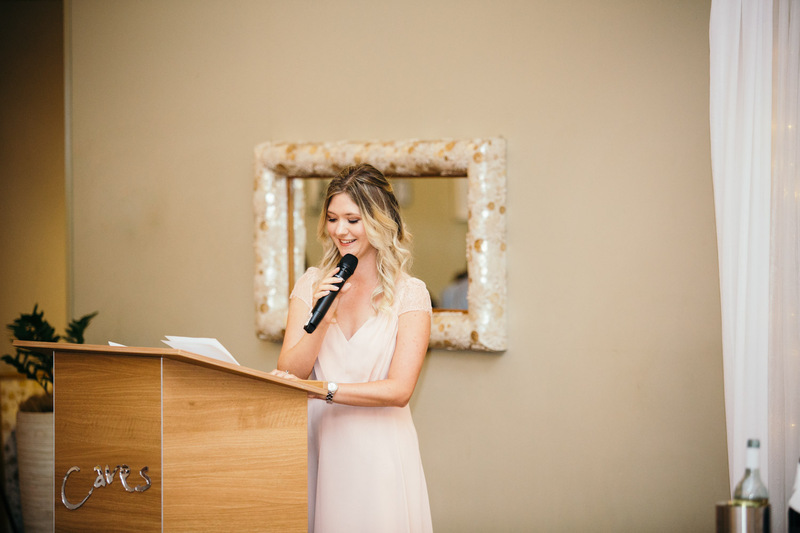 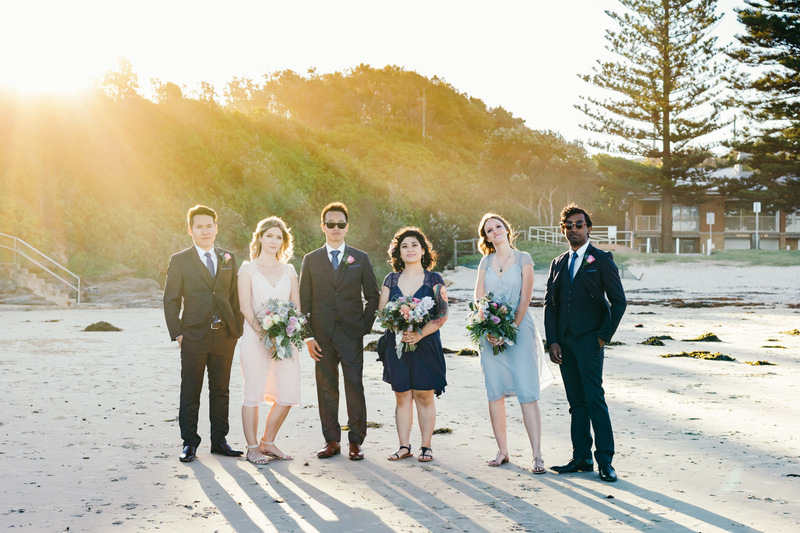 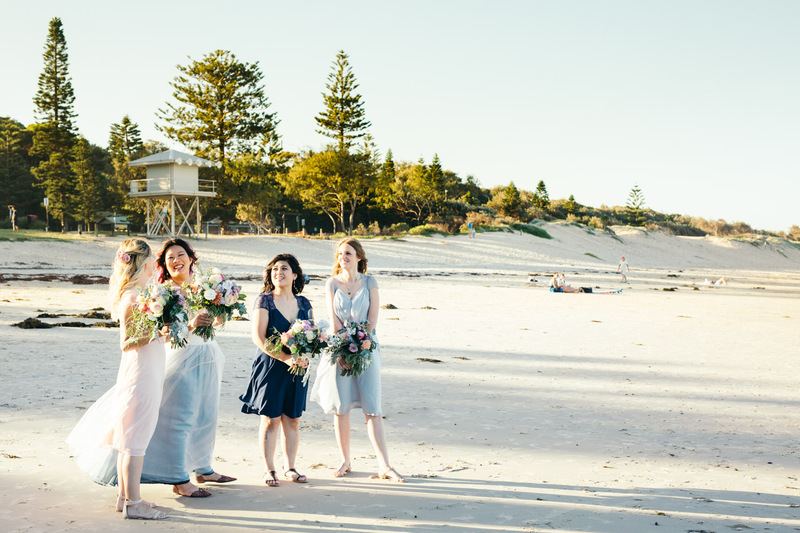 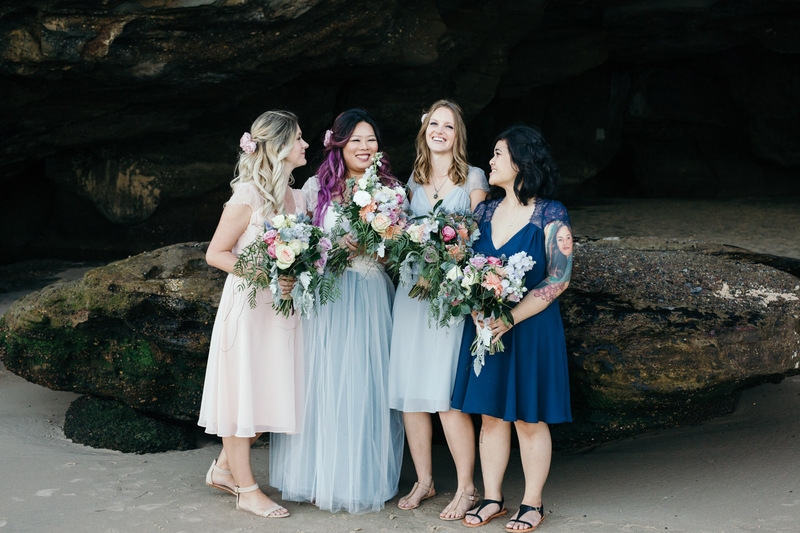 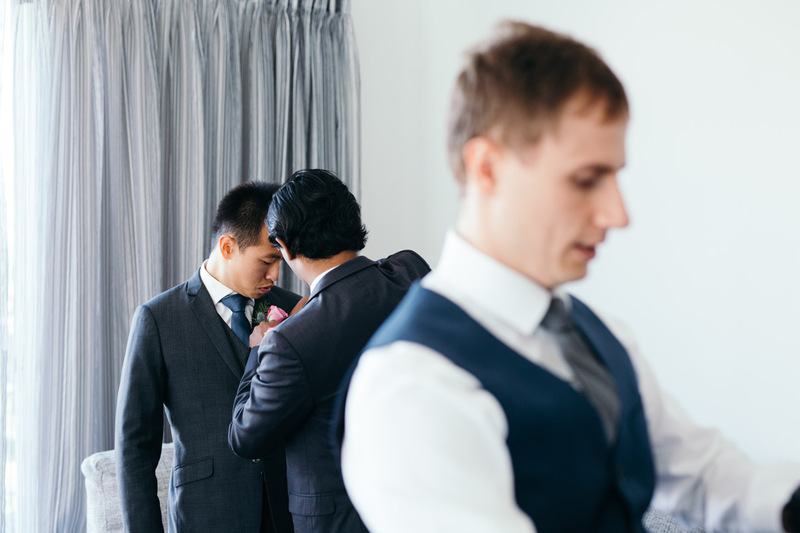 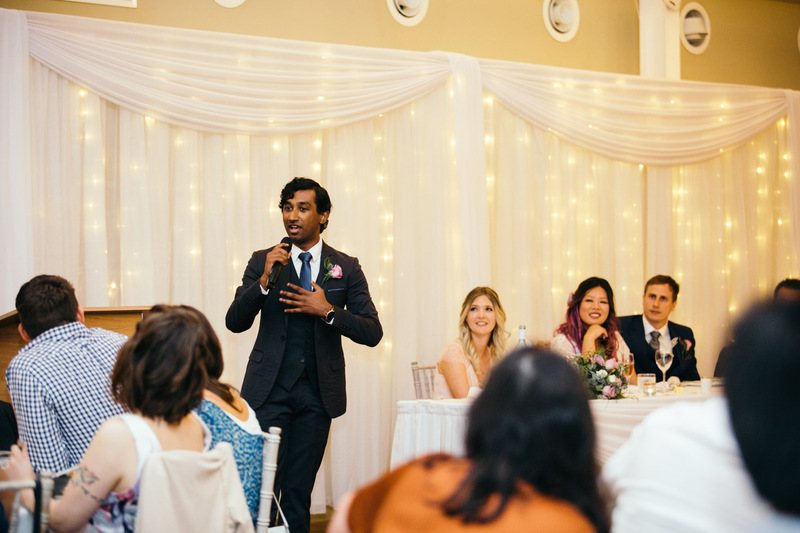 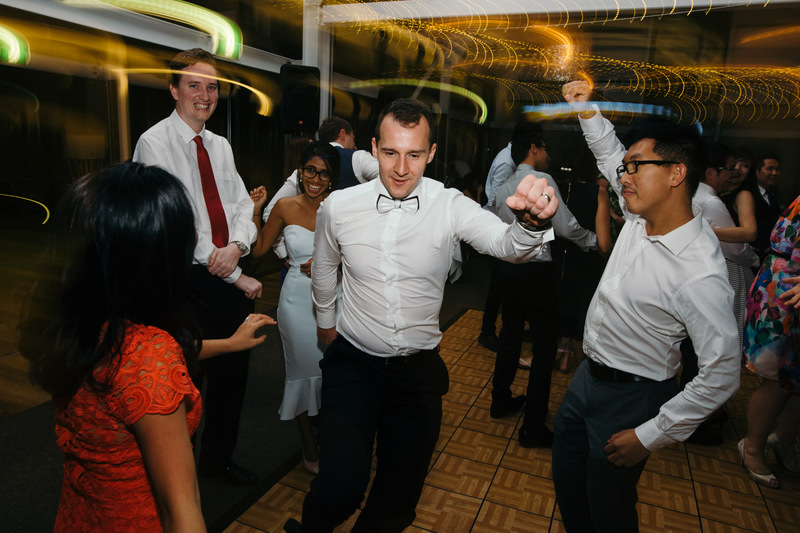 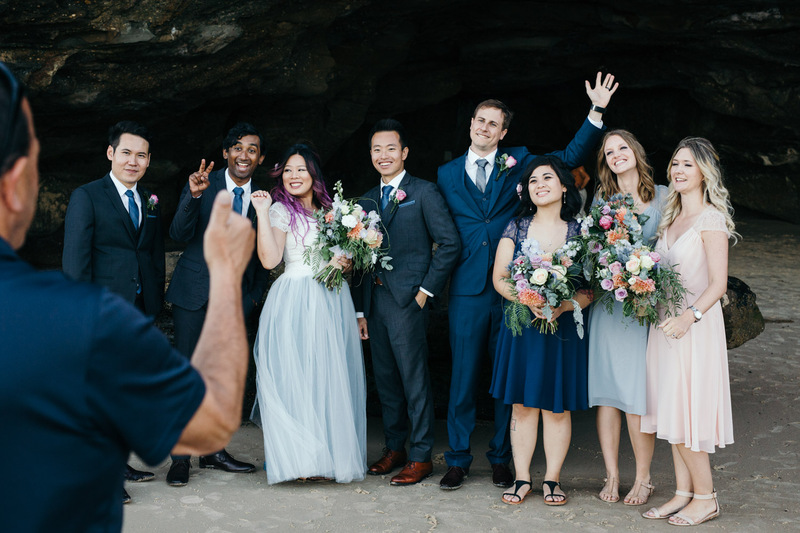 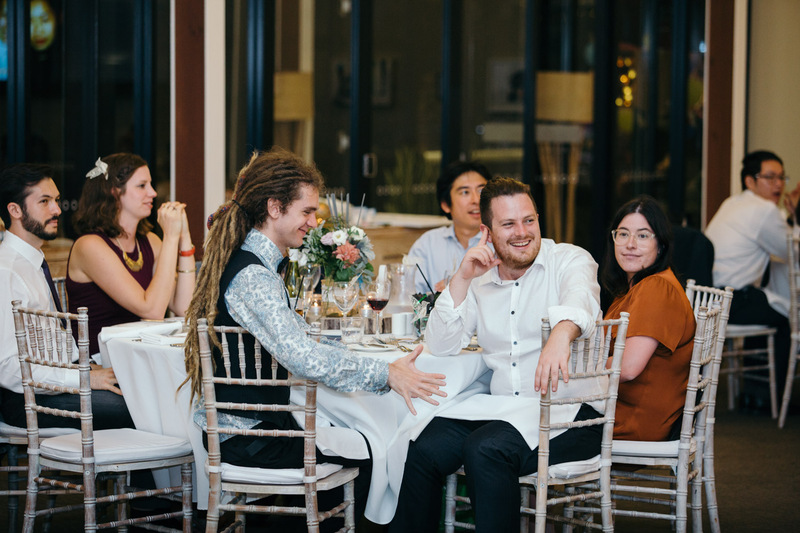 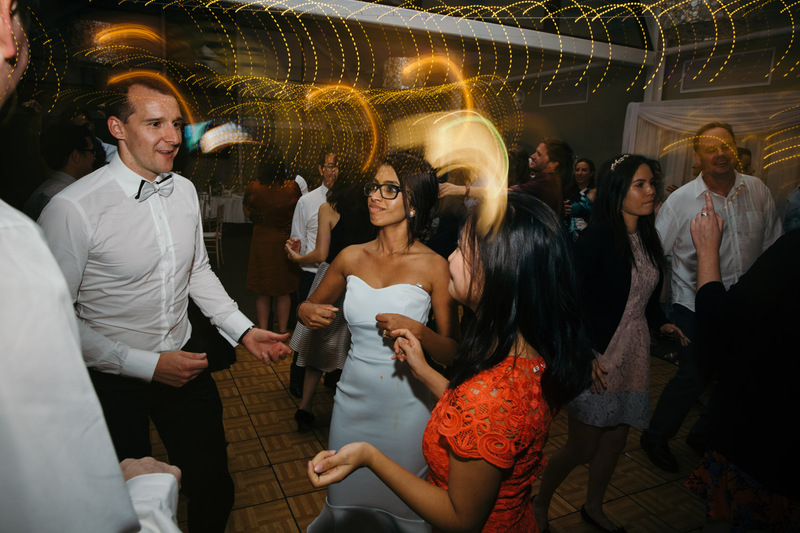 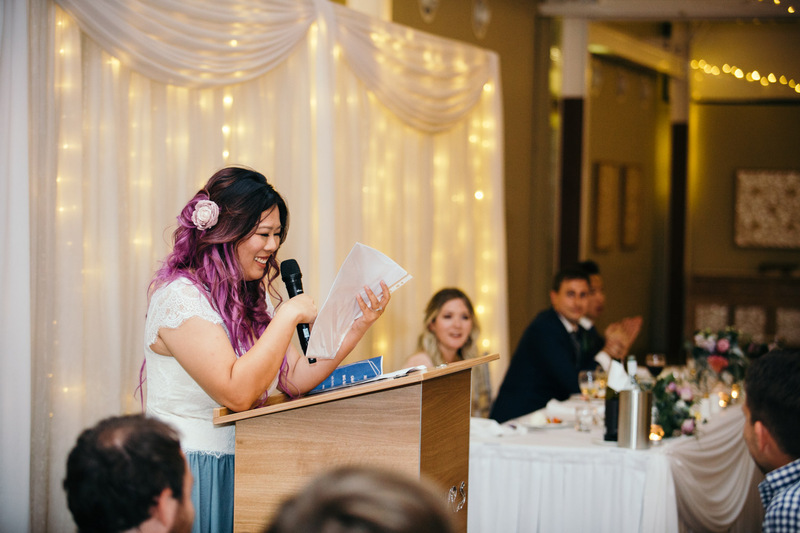 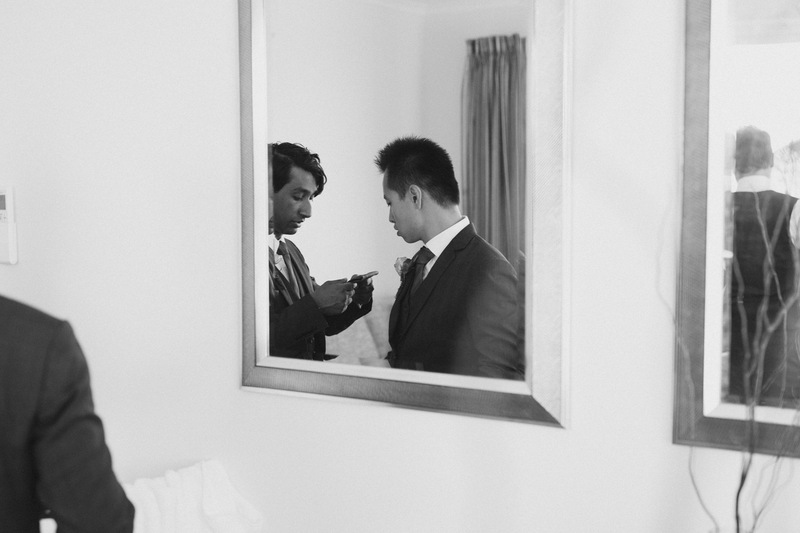 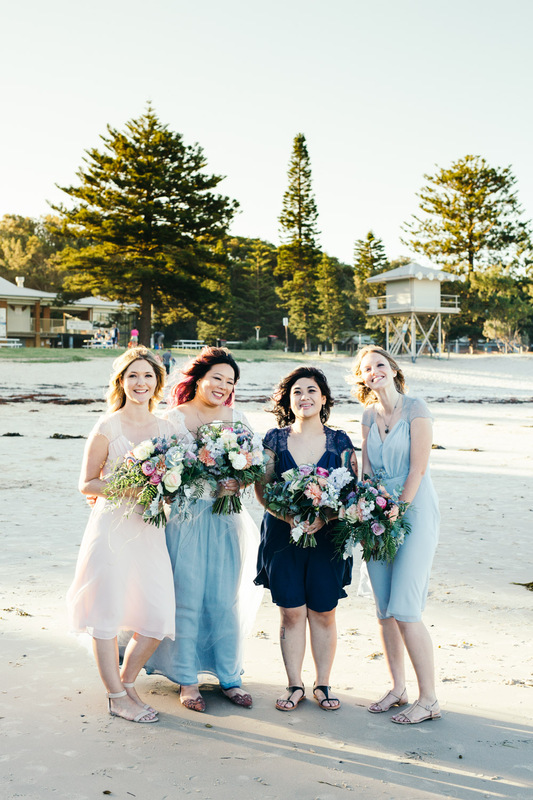 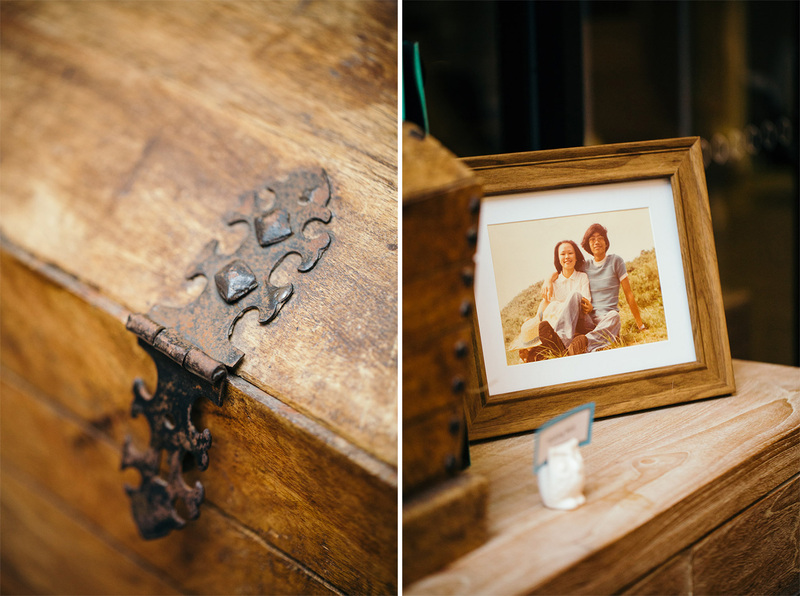 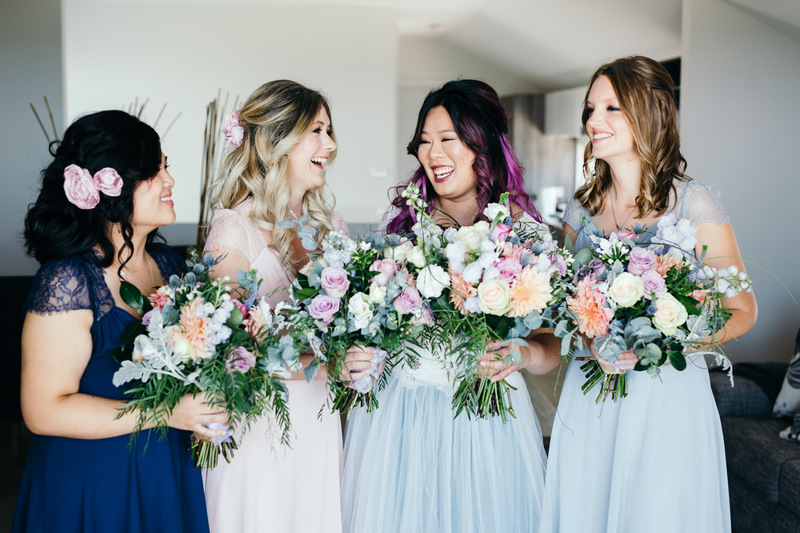 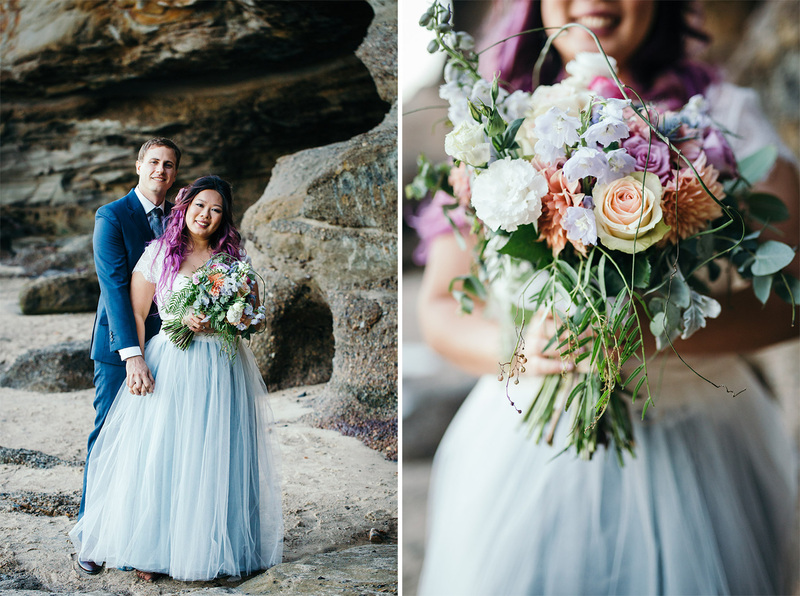 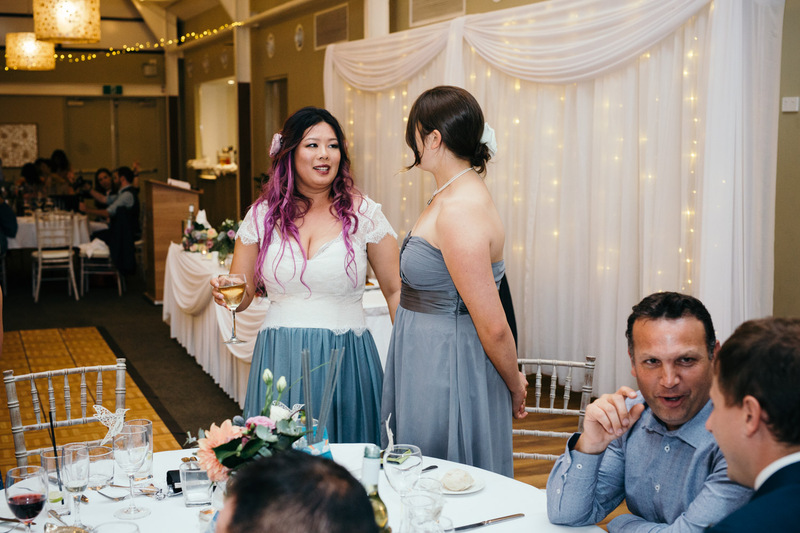 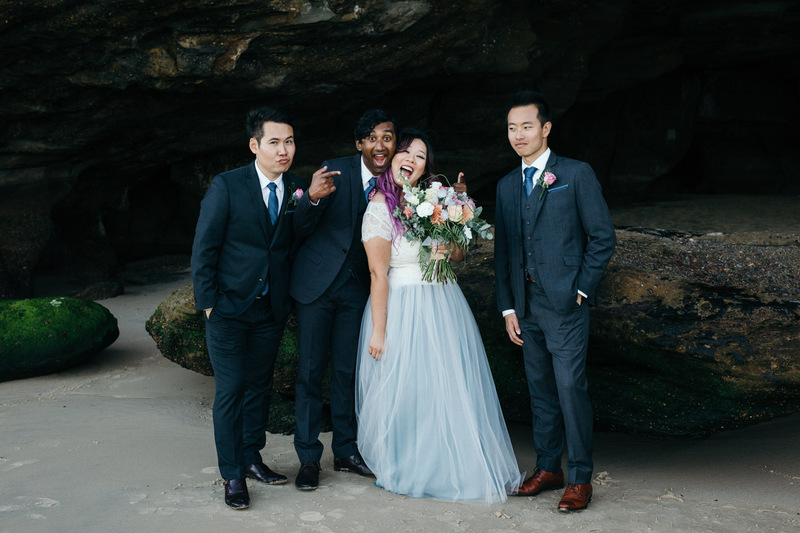 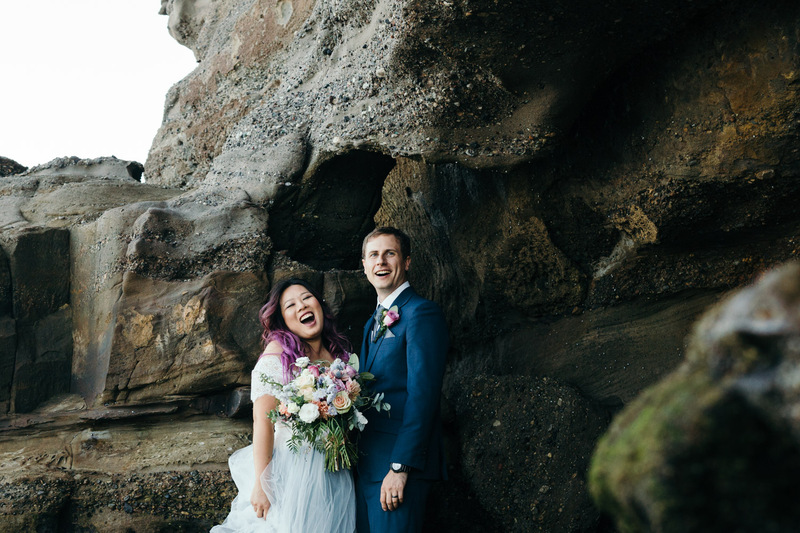 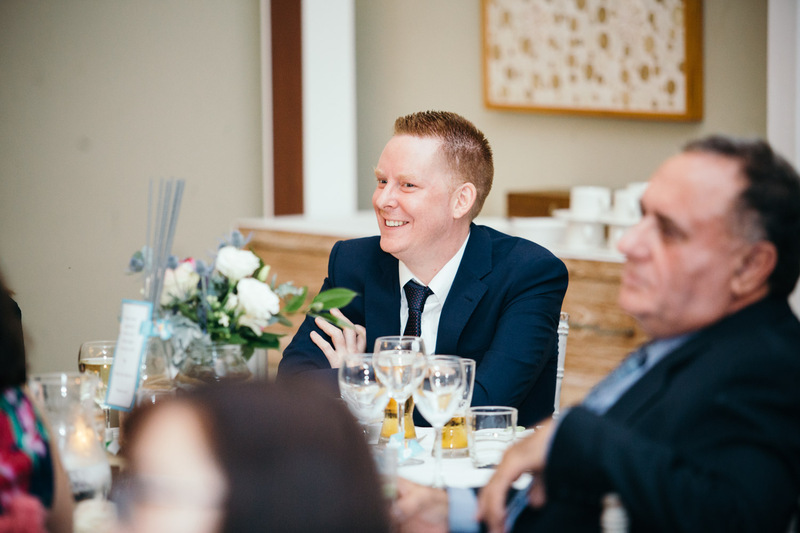 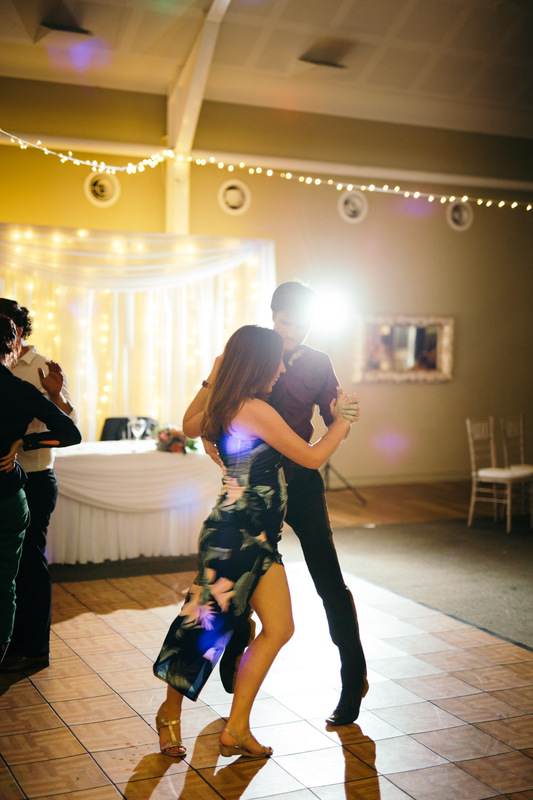 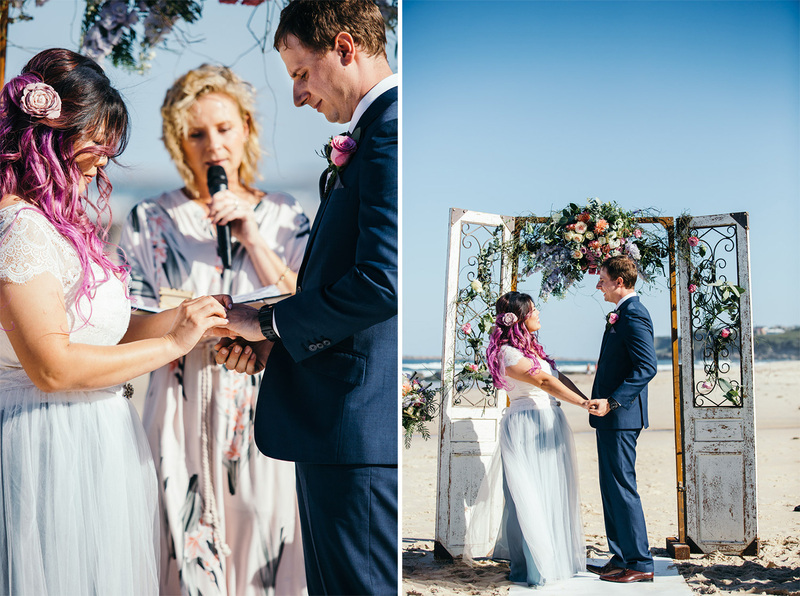 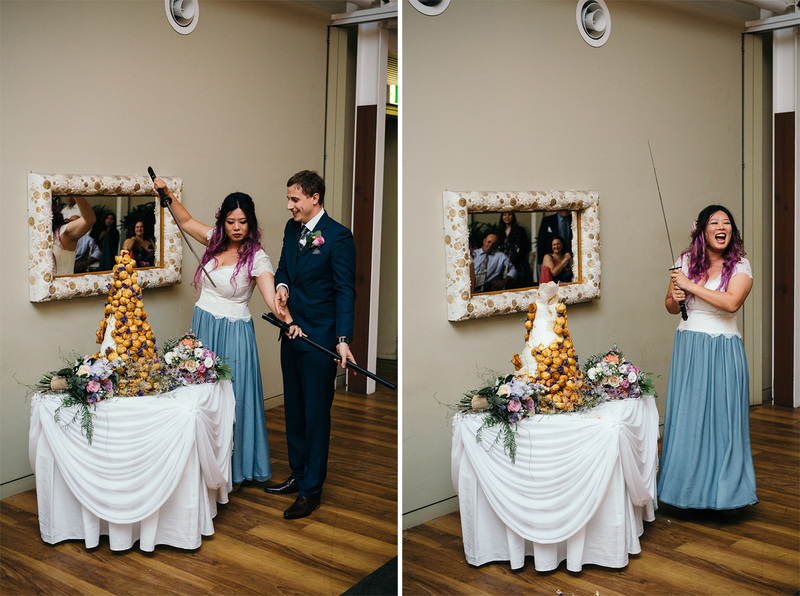 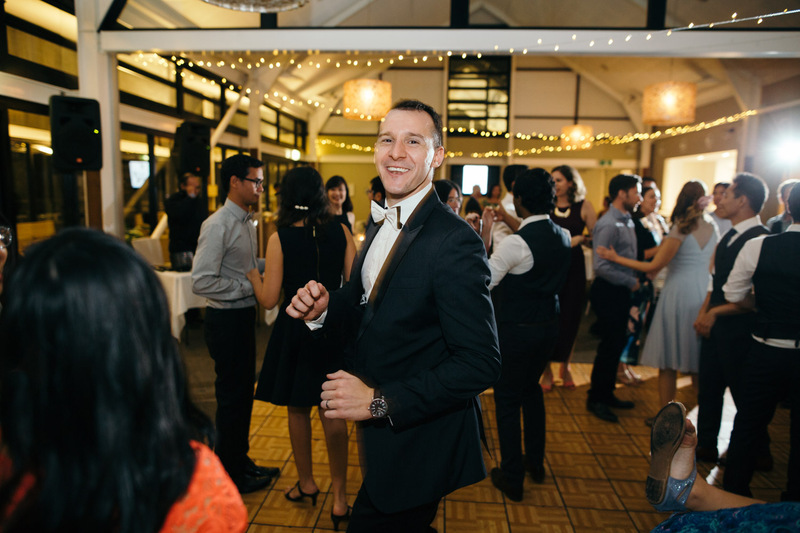 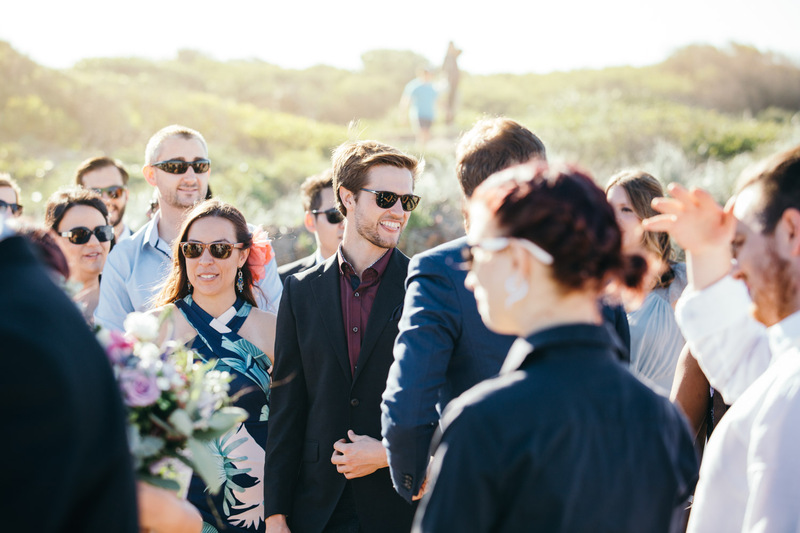 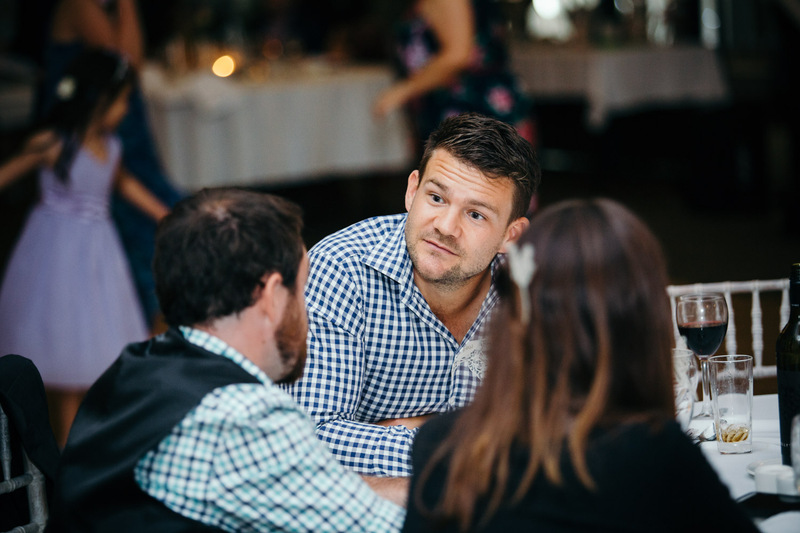 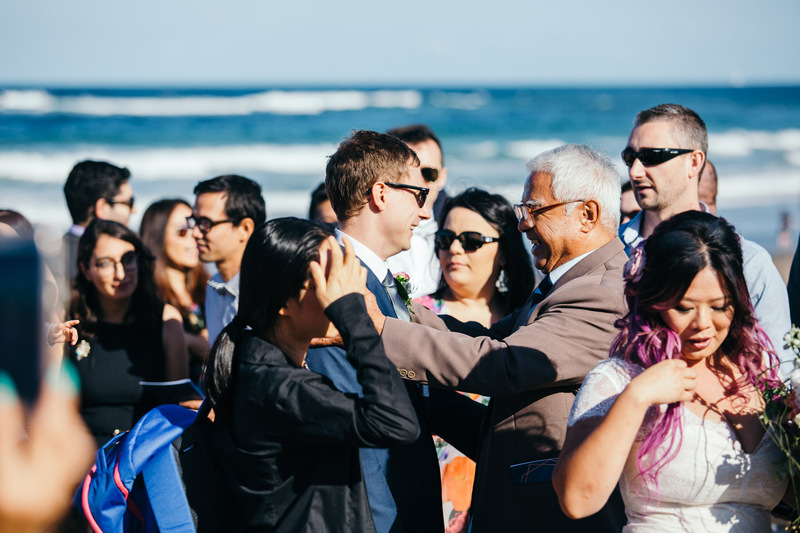 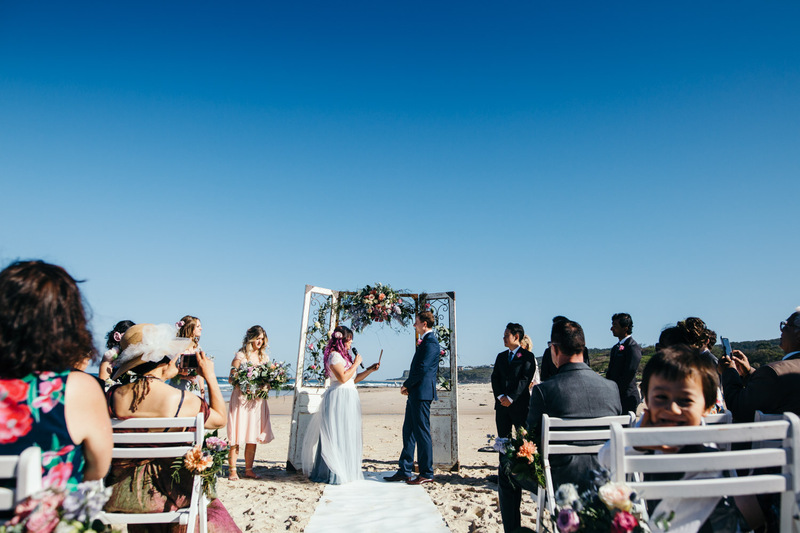 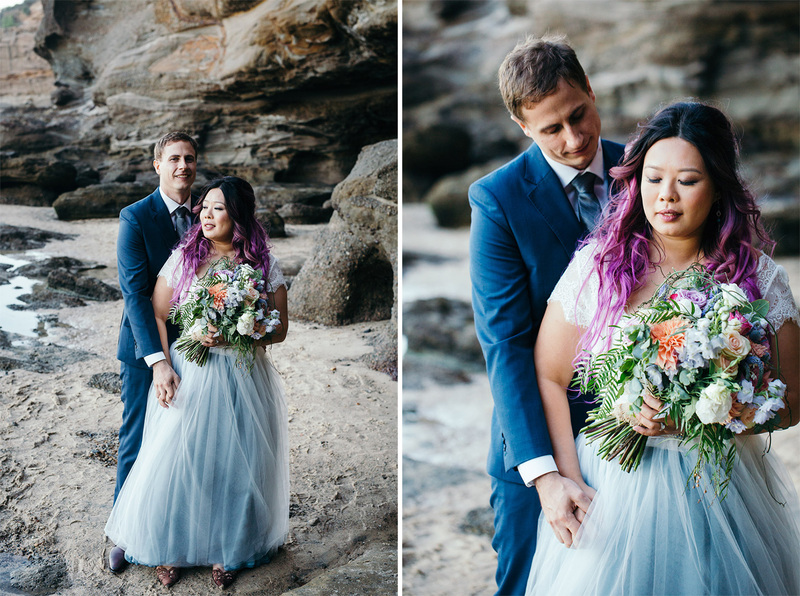 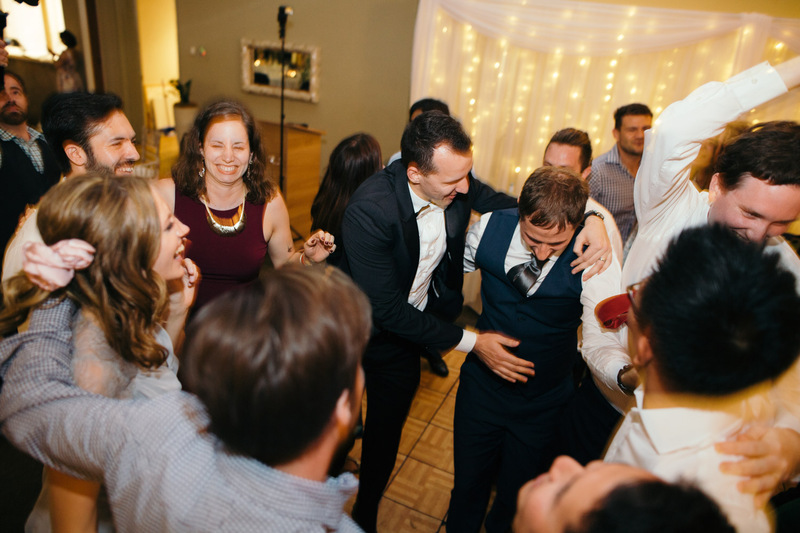 Grace and Jules decided to tie-the-knot with a wedding at the Caves Beach Hotel because they fell in love with the warm white sand and the laid-back vibes. 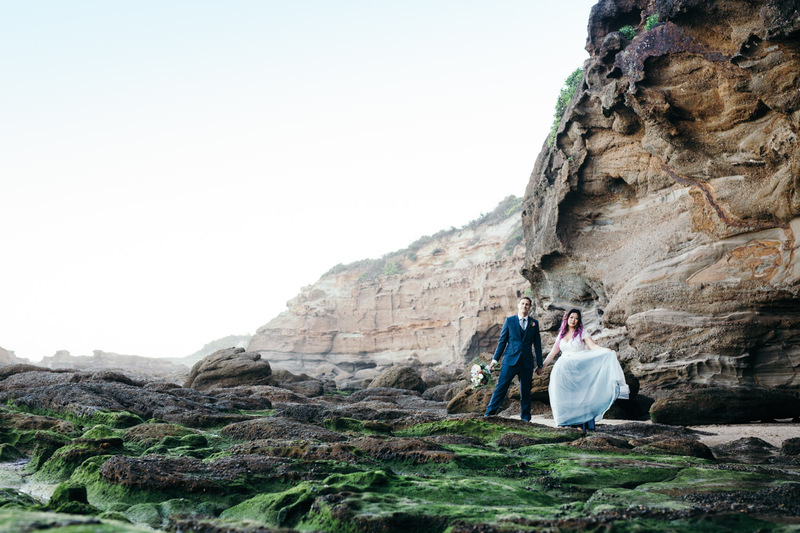 Caves Beach is a partially-developed coastal environment near Swansea on the New South Wales north coast. 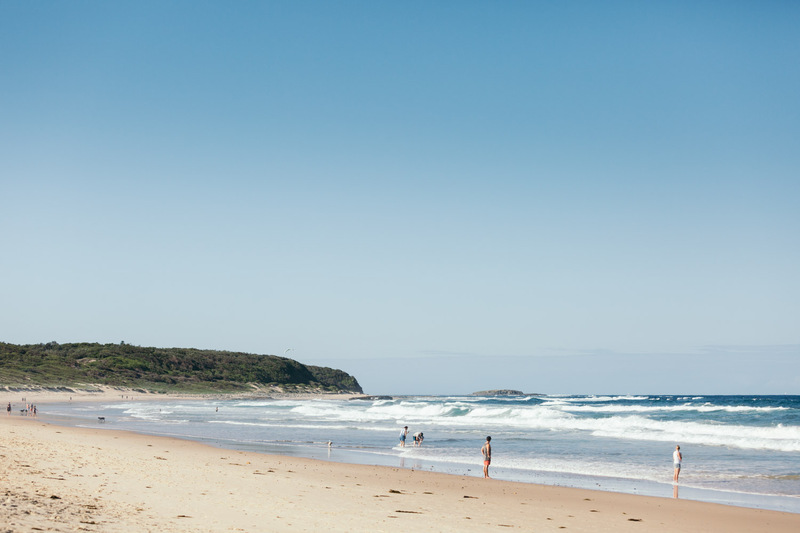 Part of the Lake Macquarie area, Caves Beach stretches approximately 2 kilometres and is popular amongst windsurfers. 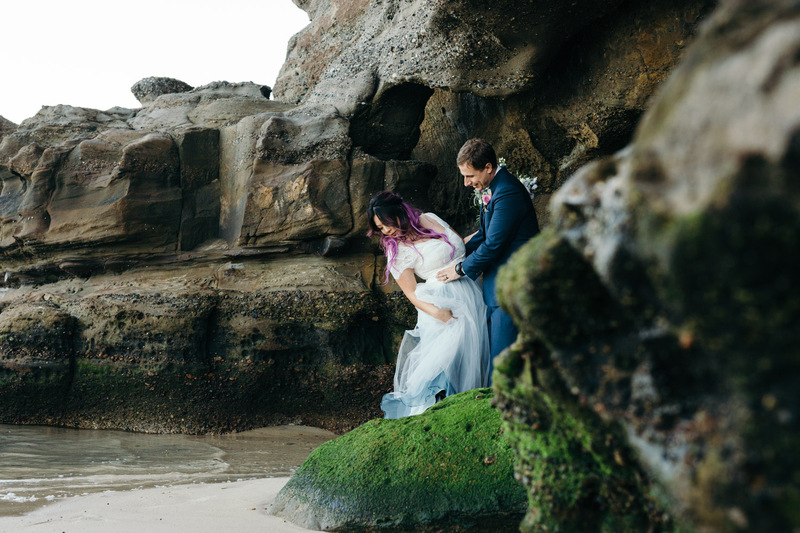 For those interested, in geological terms, Lake Macquarie is actually a lagoon (or more technically, a wave-dominated estuary) as opposed to a lake (a lake is an example of a lacusterine environment, which usually has a greater fluvial [river] influence). 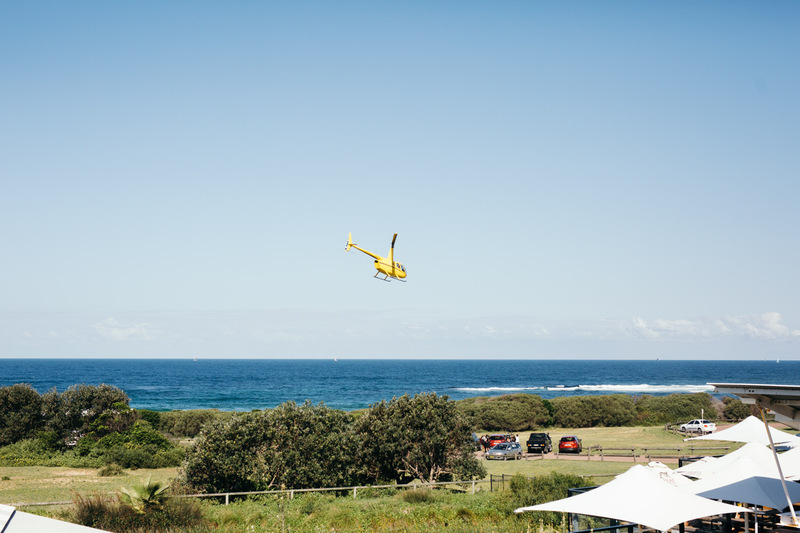 Caves Beach is located on the lagoon’s southern barrier system. 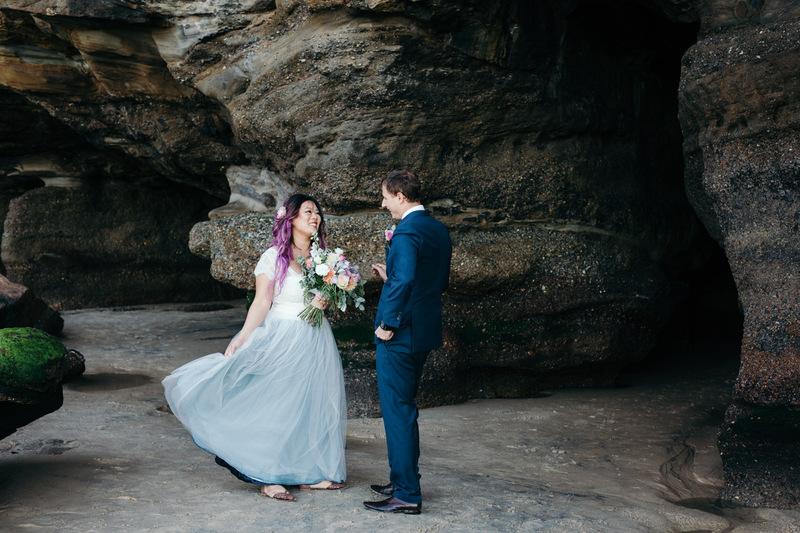 At the very southern end of Caves Beach is the area’s main attraction – a network of large caves and rock pools that eroded out of the sandstone cliff face. 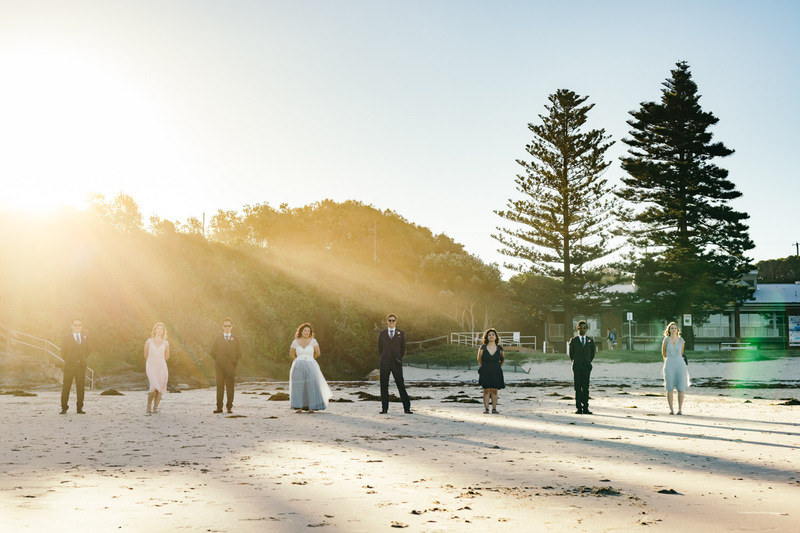 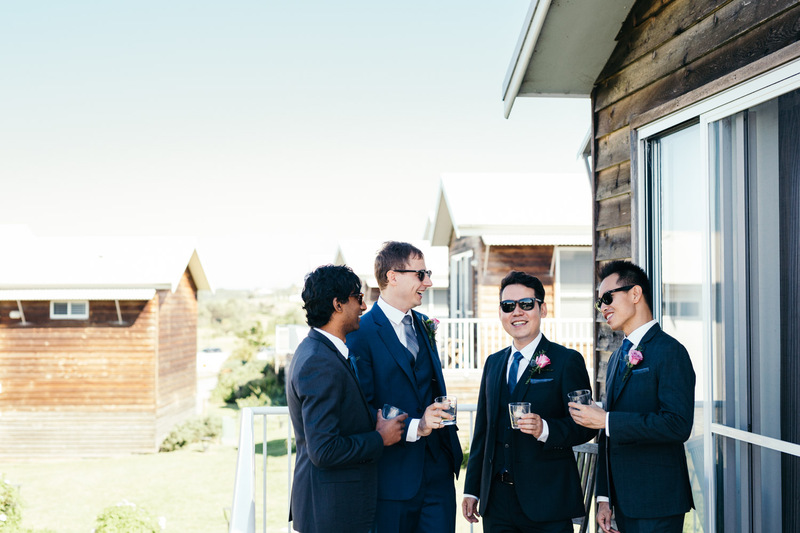 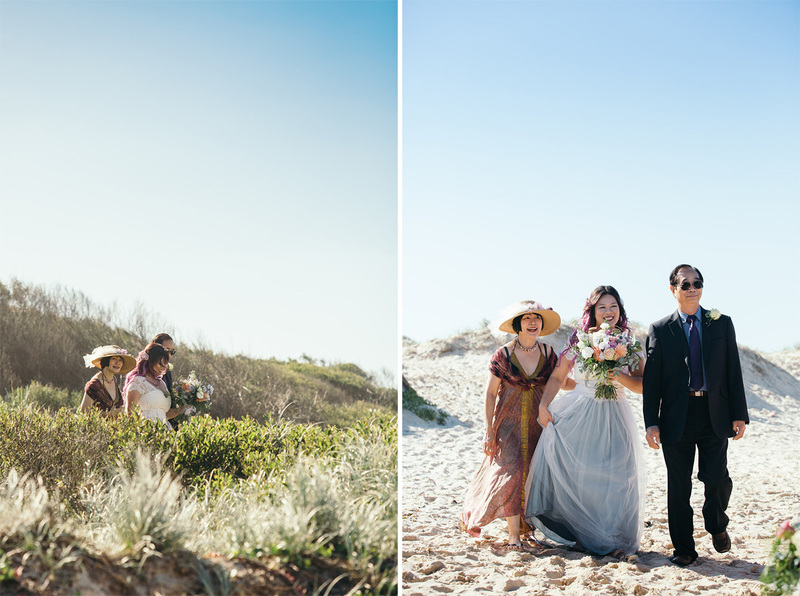 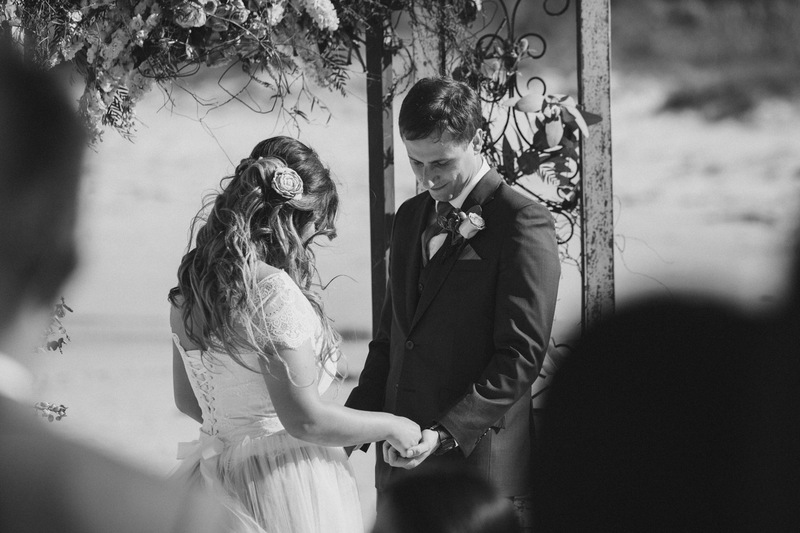 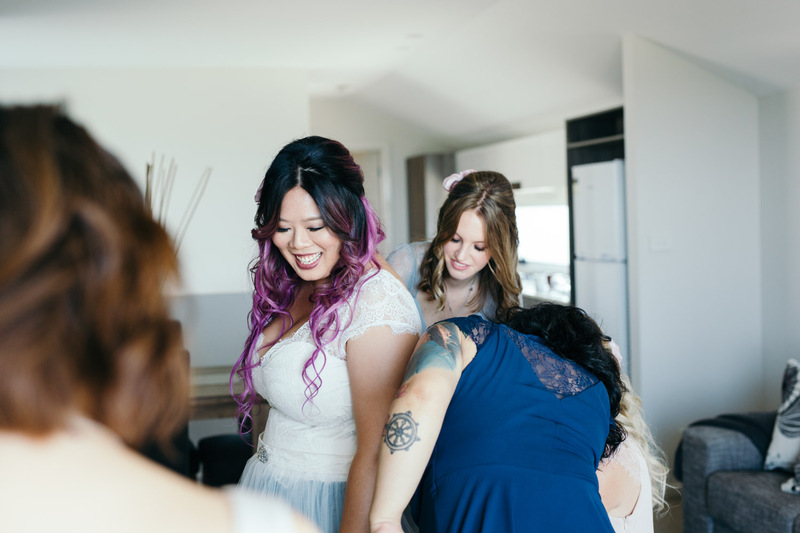 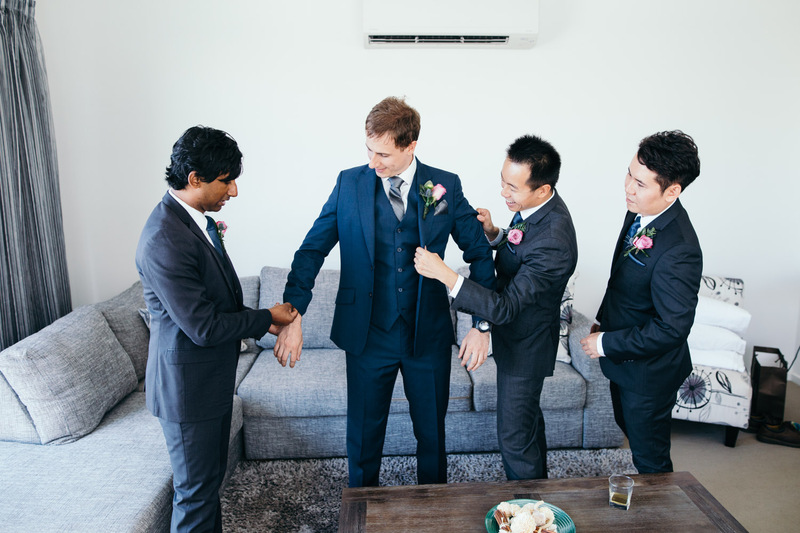 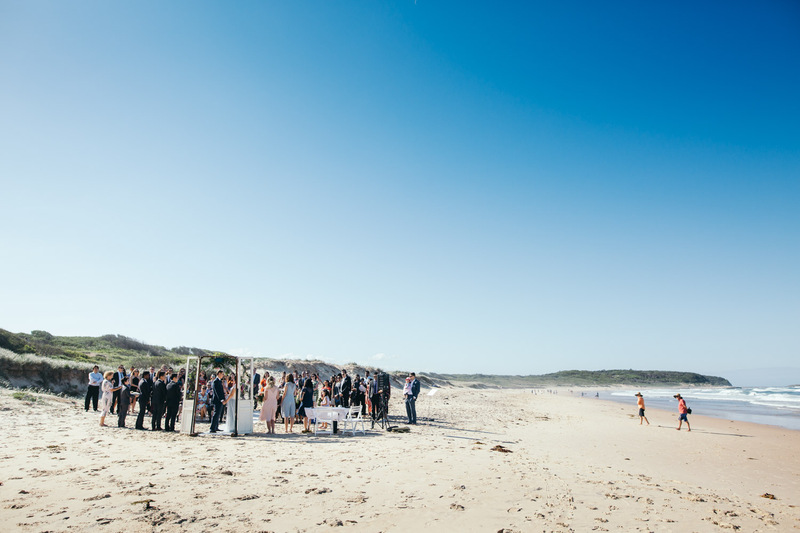 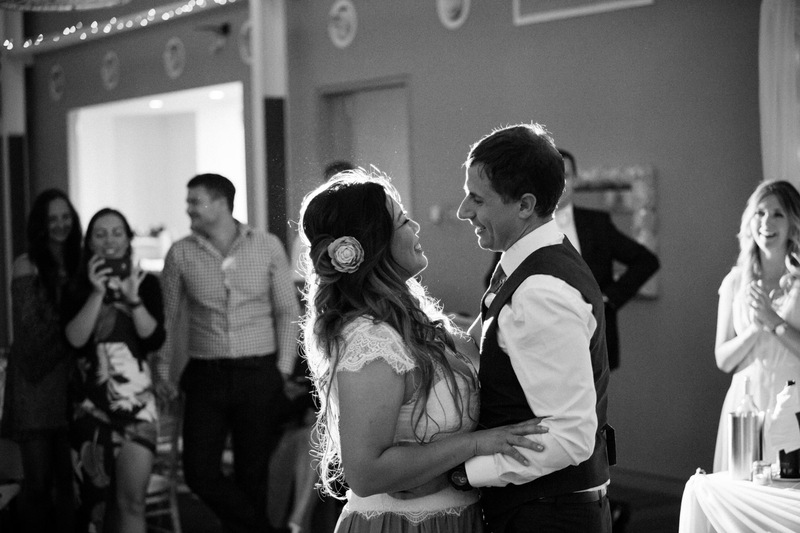 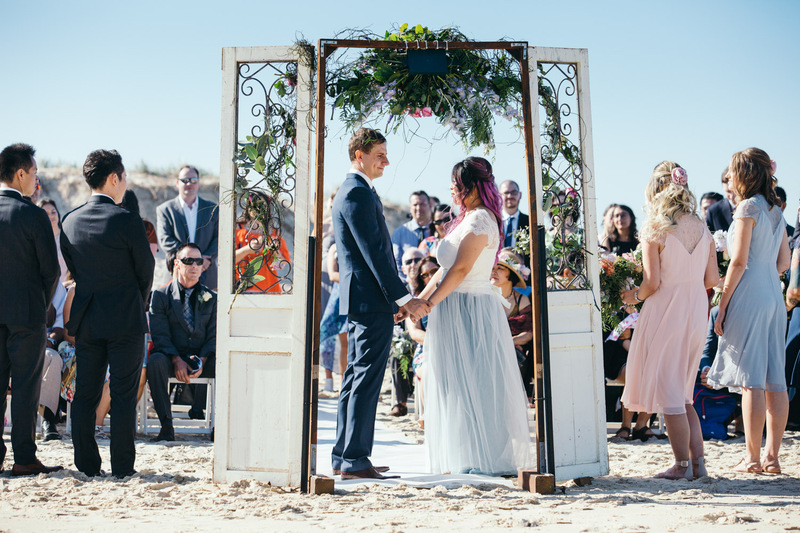 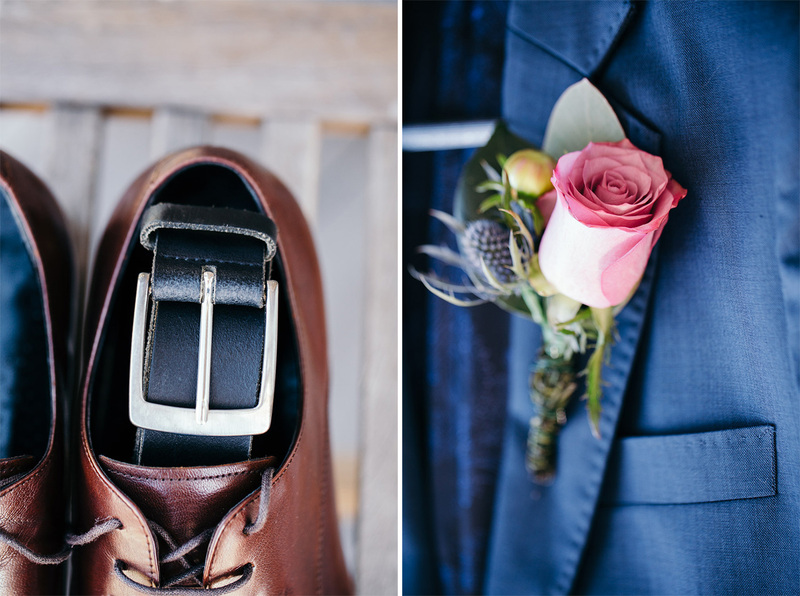 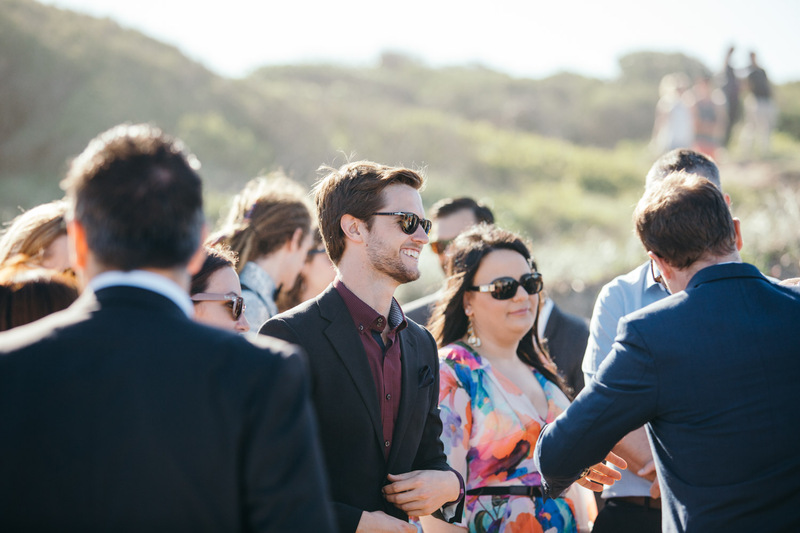 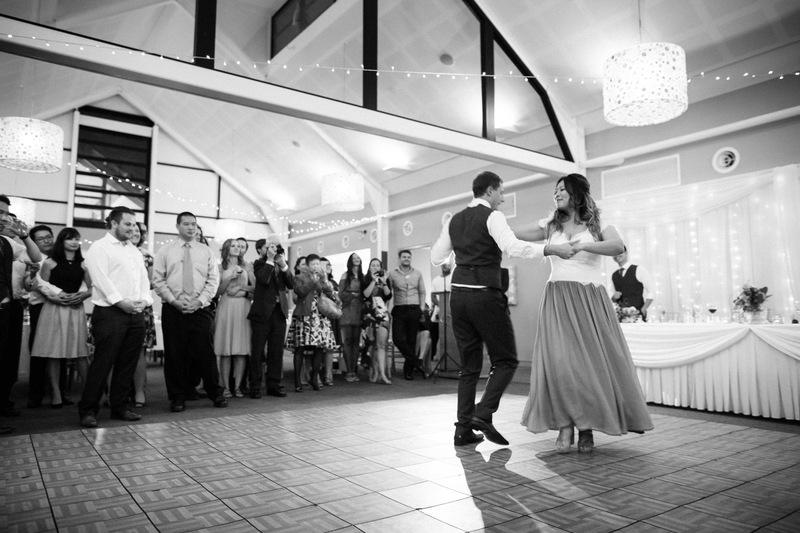 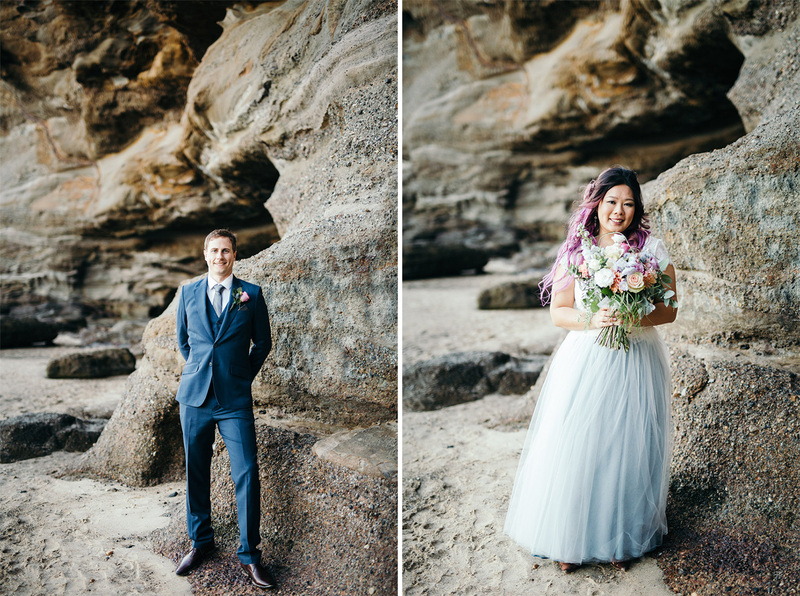 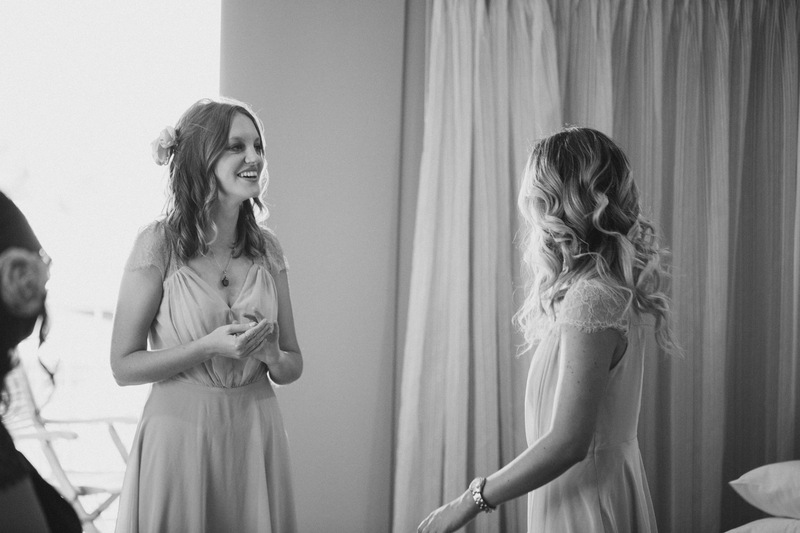 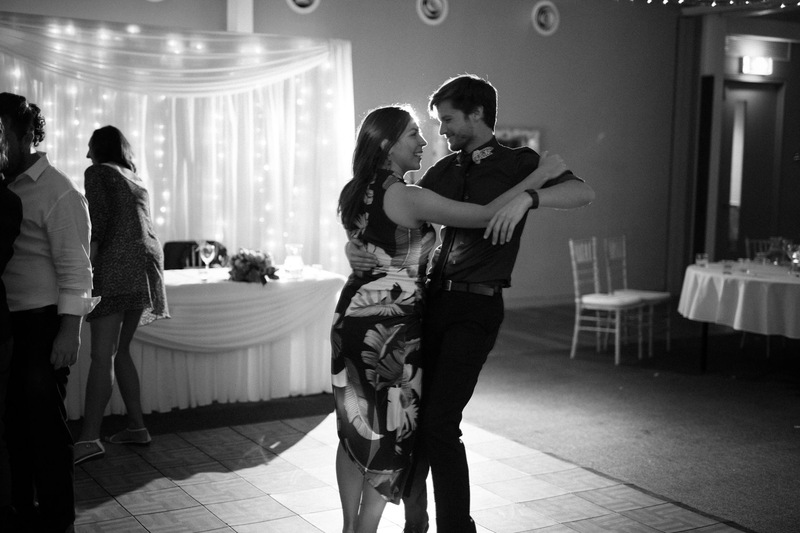 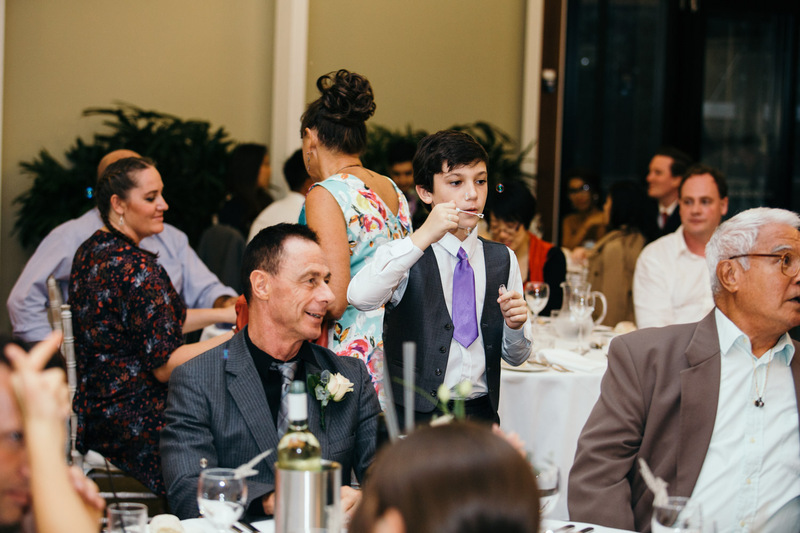 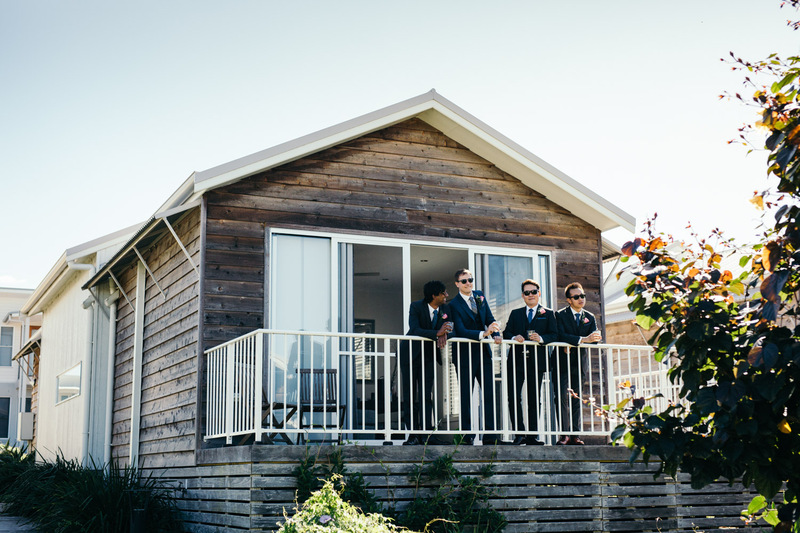 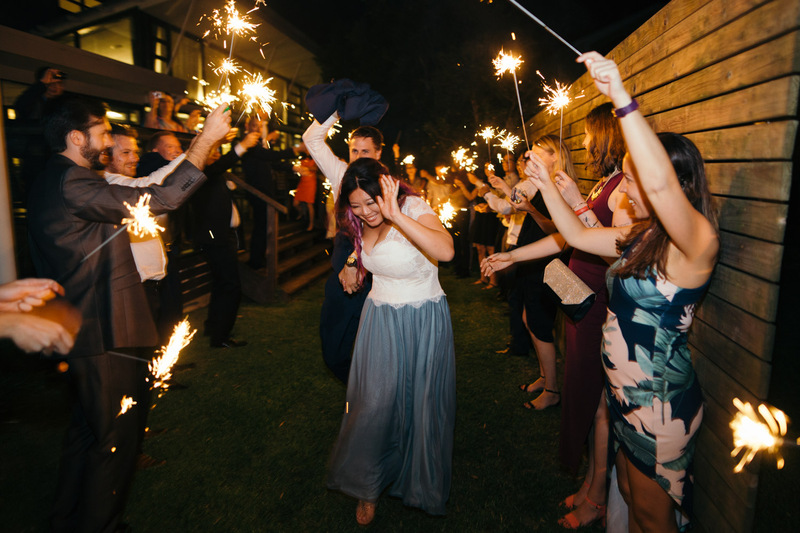 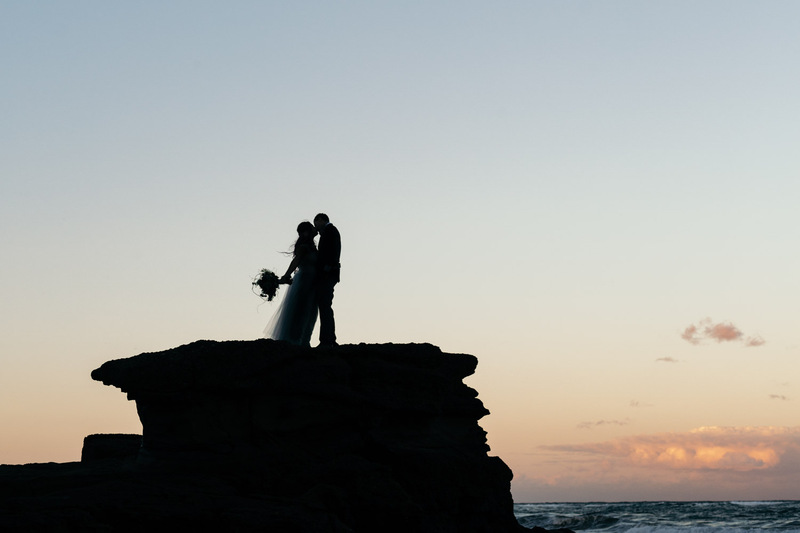 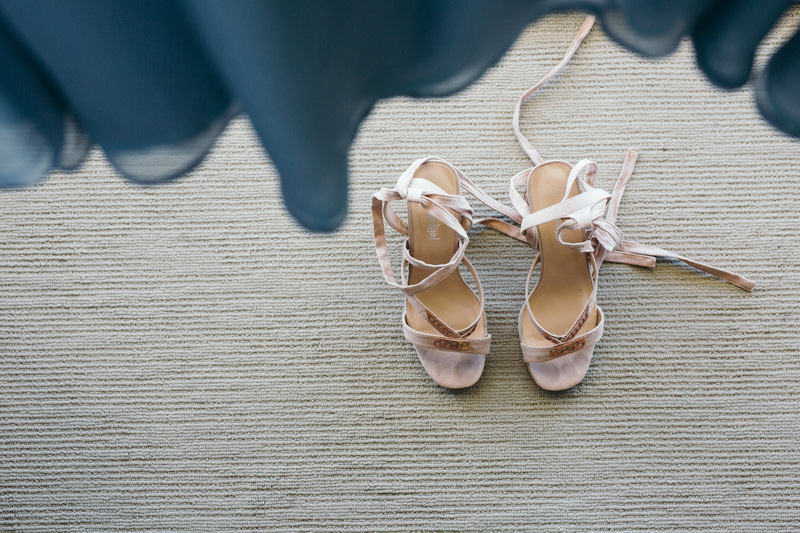 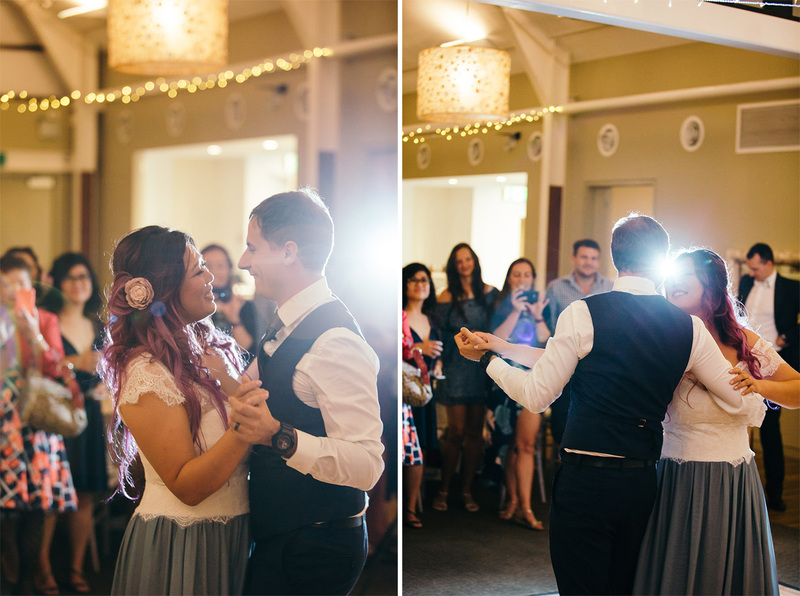 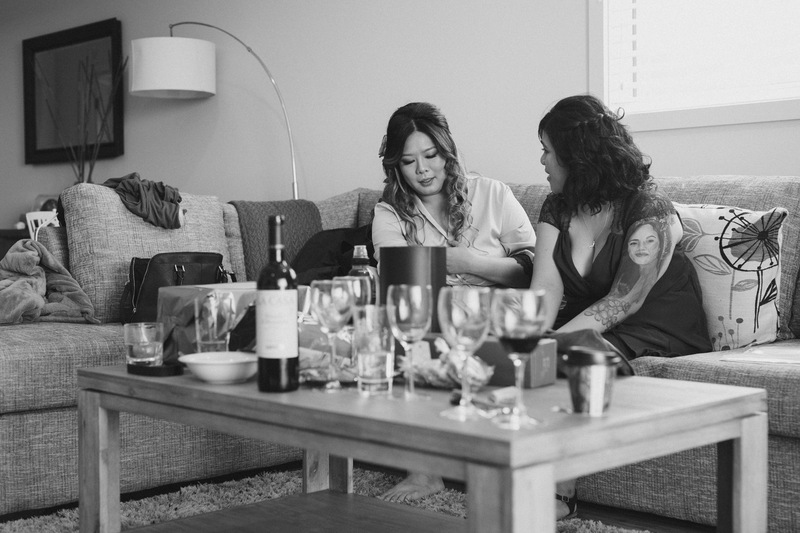 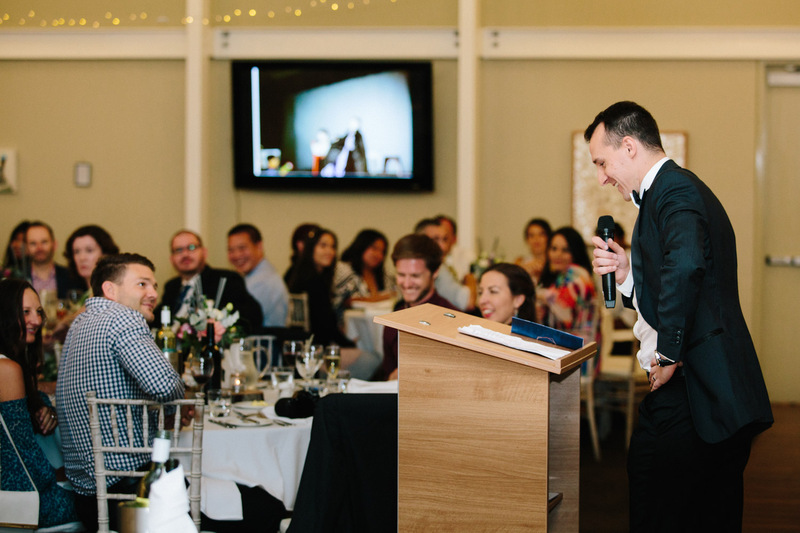 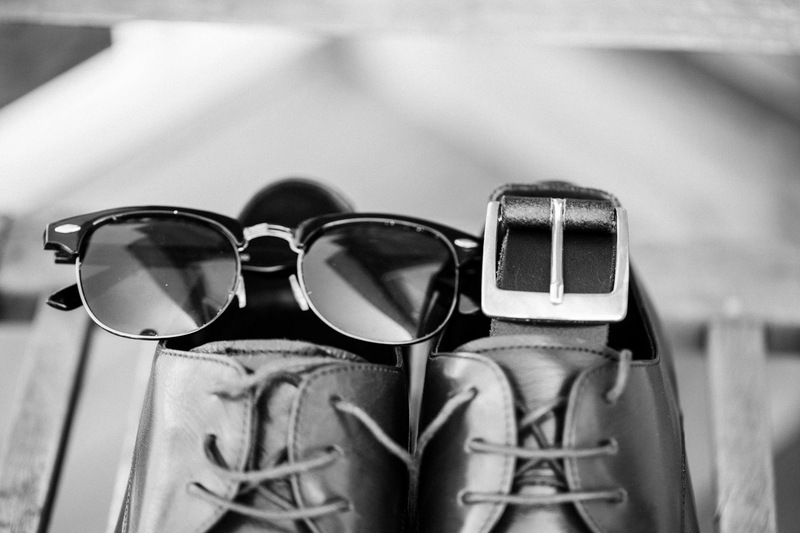 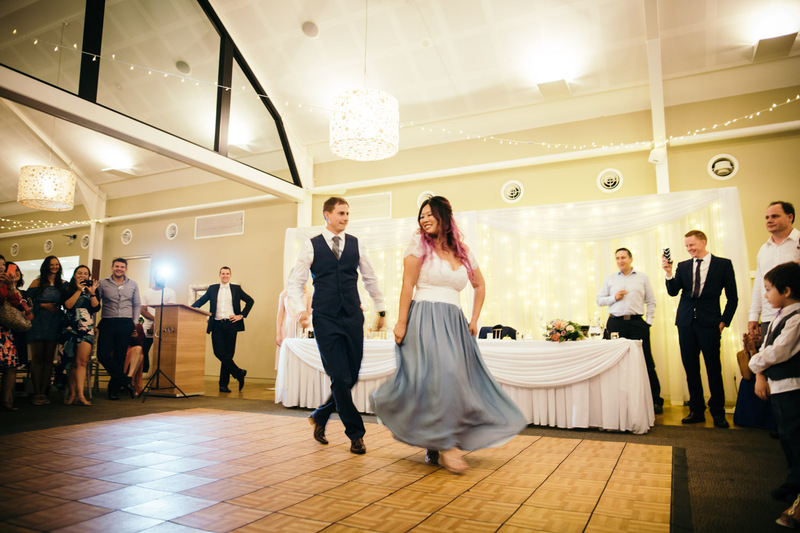 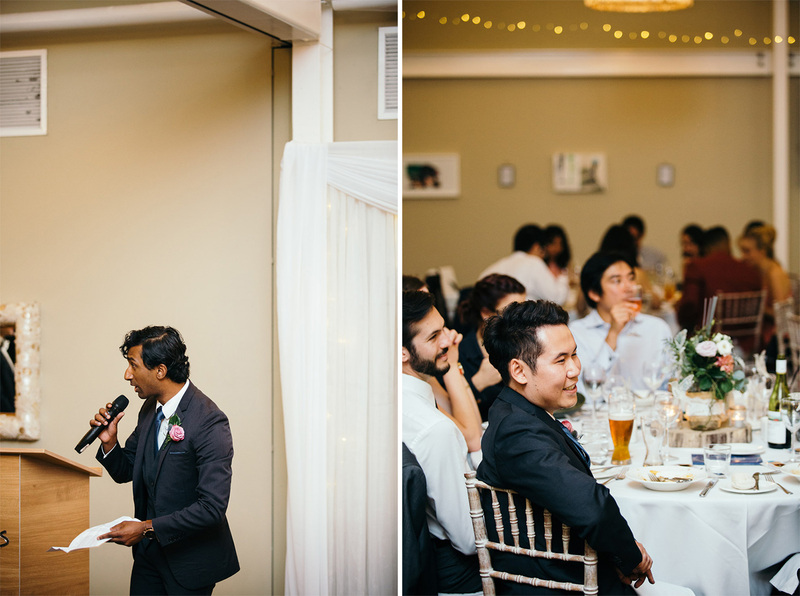 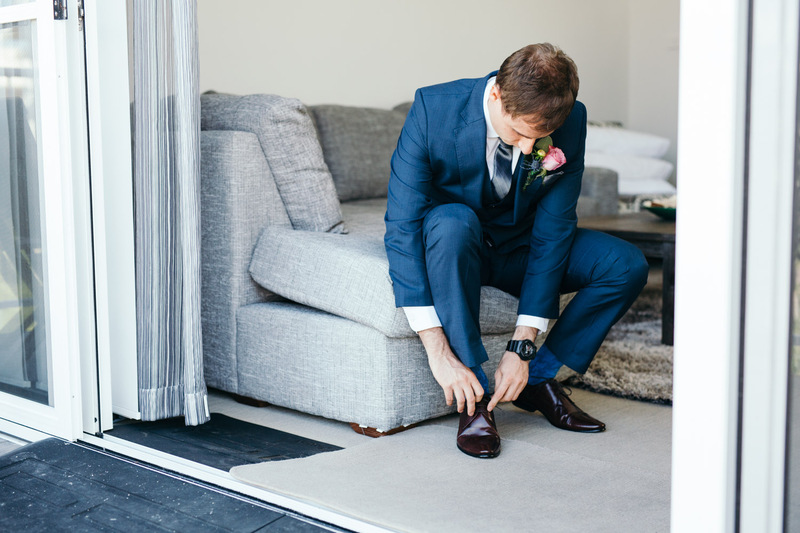 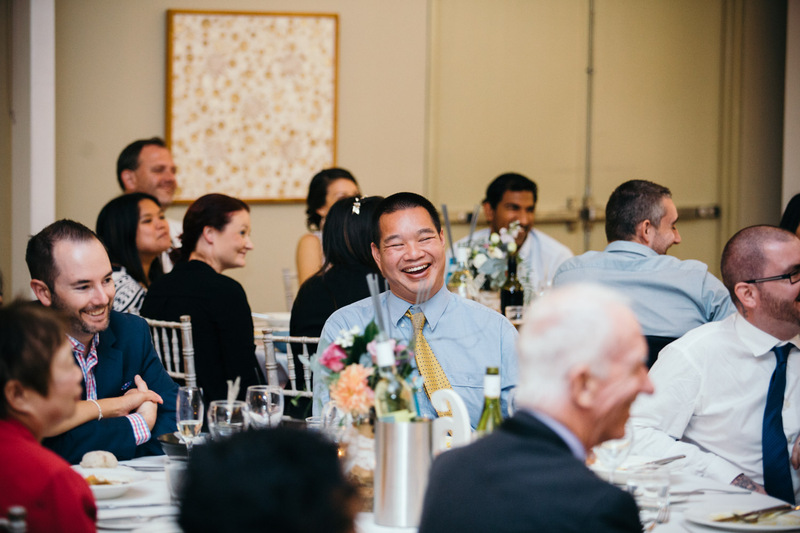 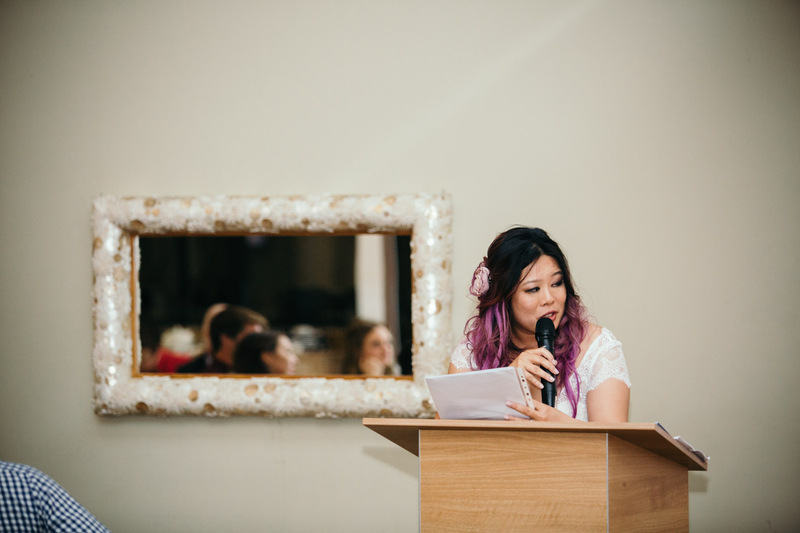 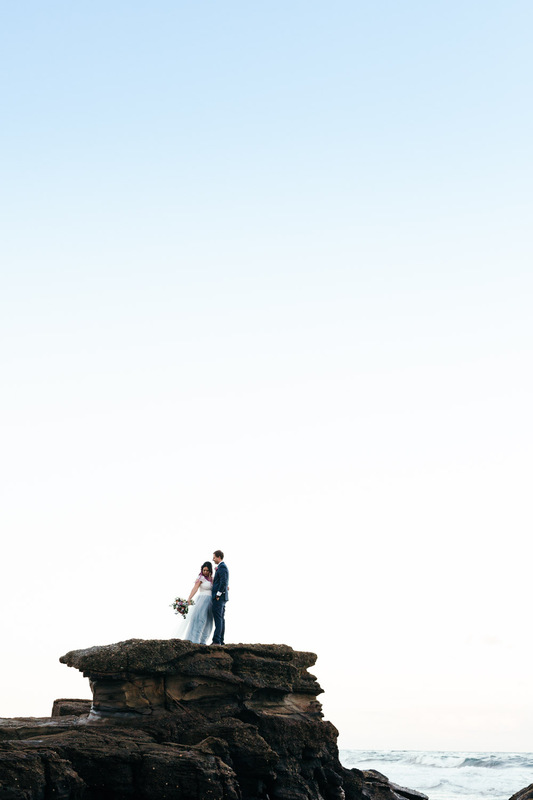 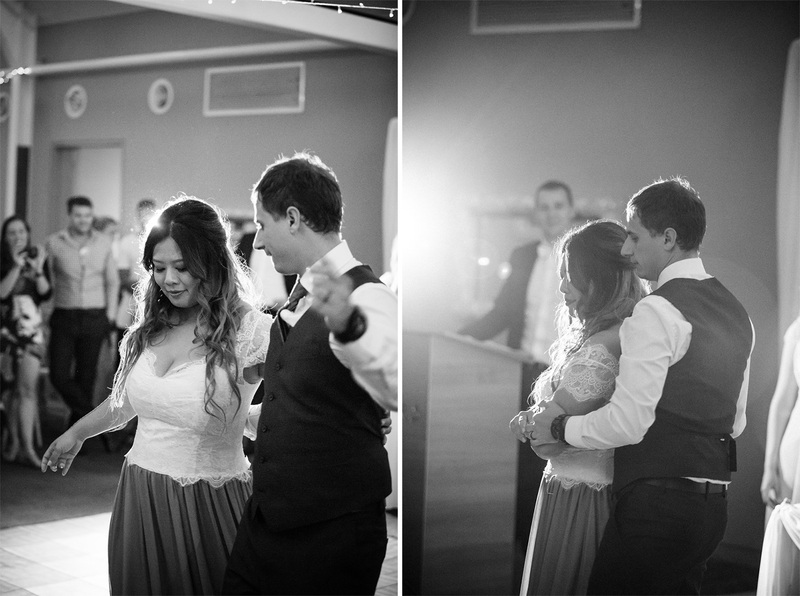 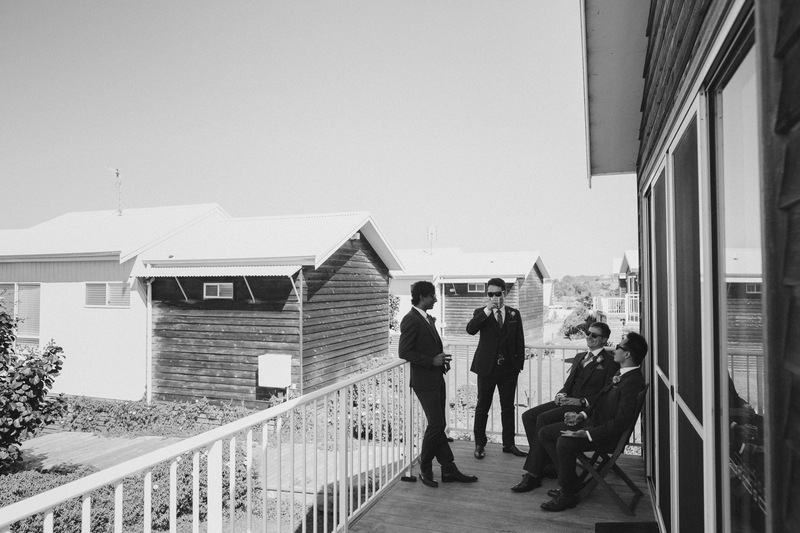 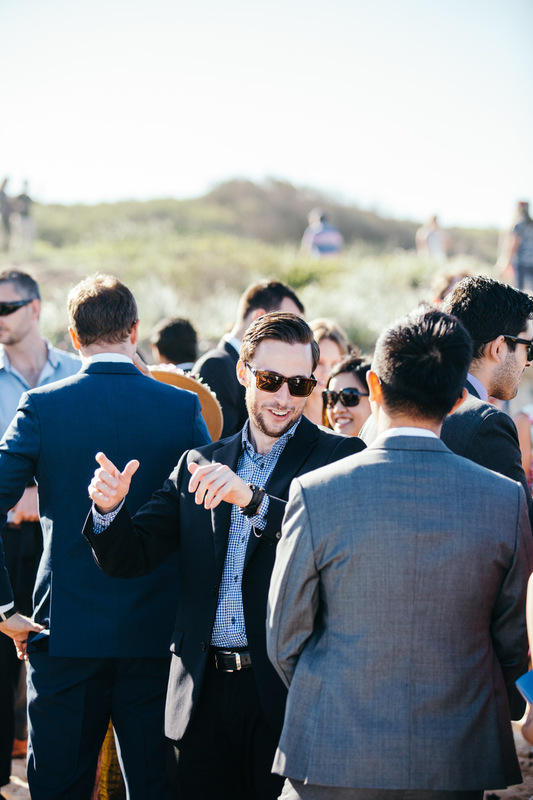 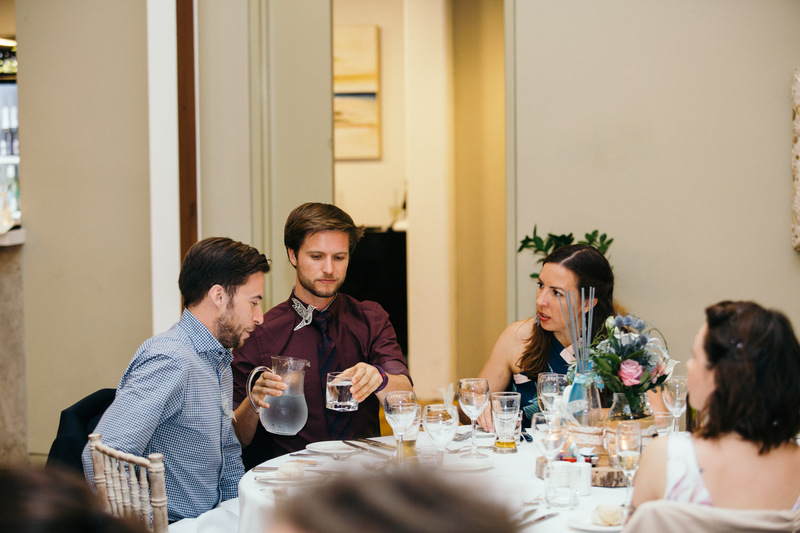 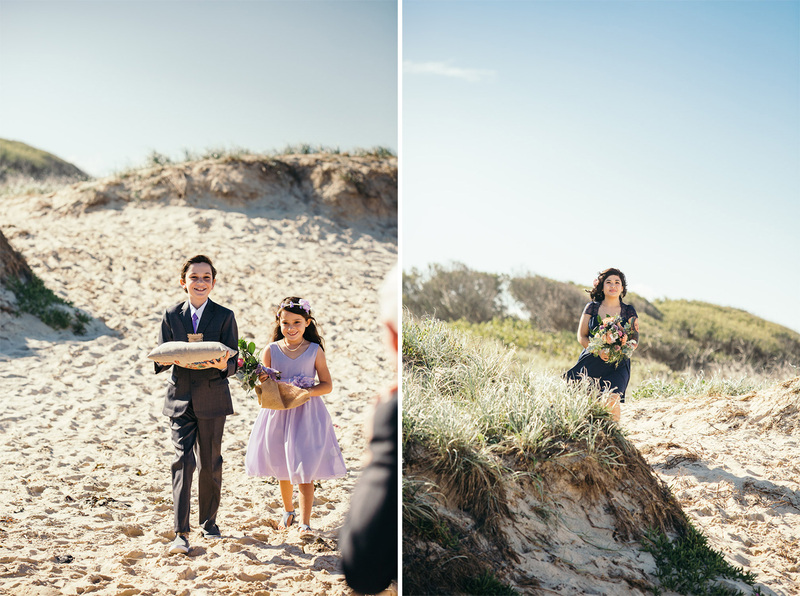 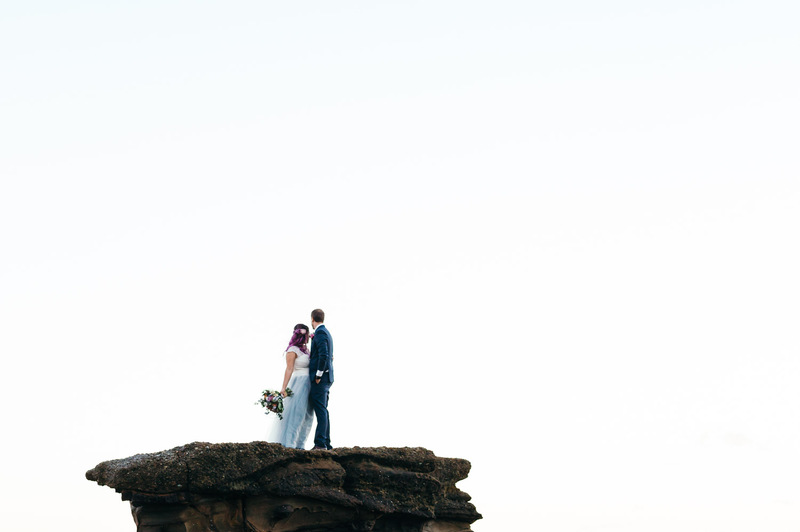 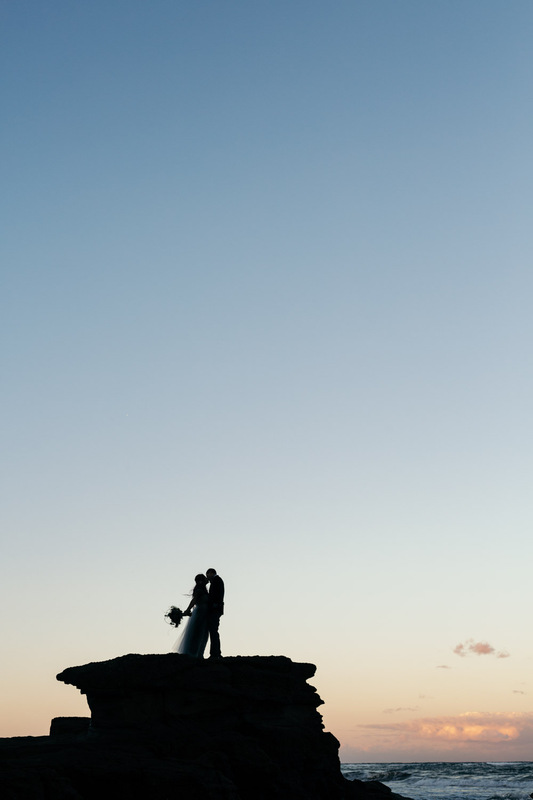 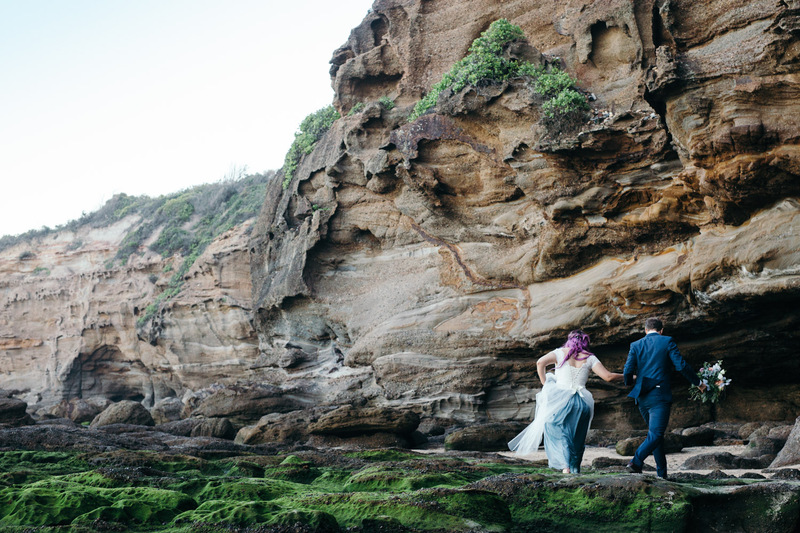 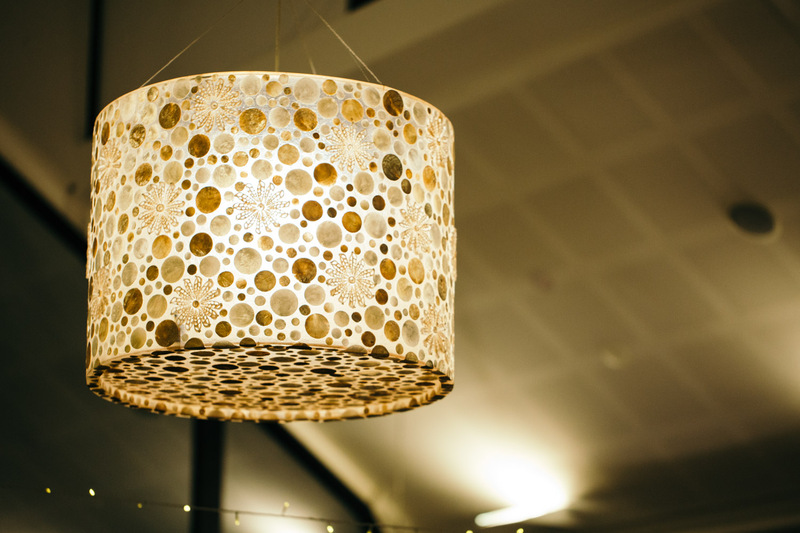 Grace and Jules were married at Caves Beach Hotel – a welcoming, contemporary venue right on the beach-front. 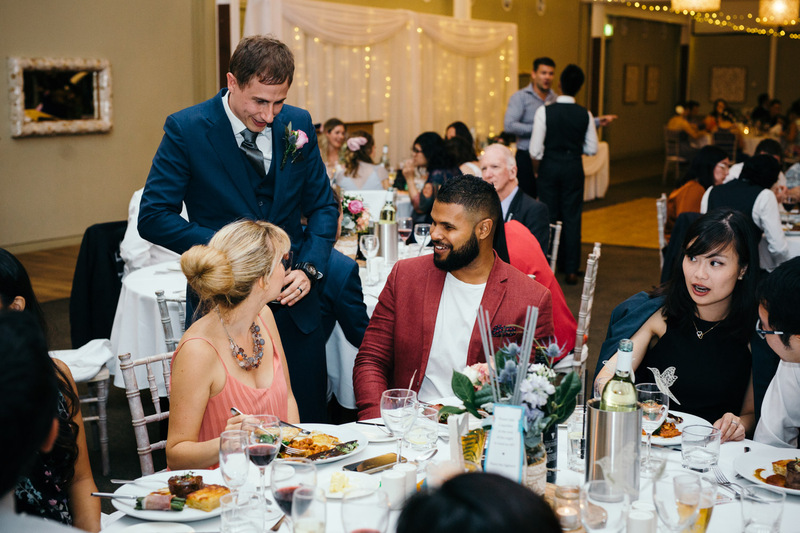 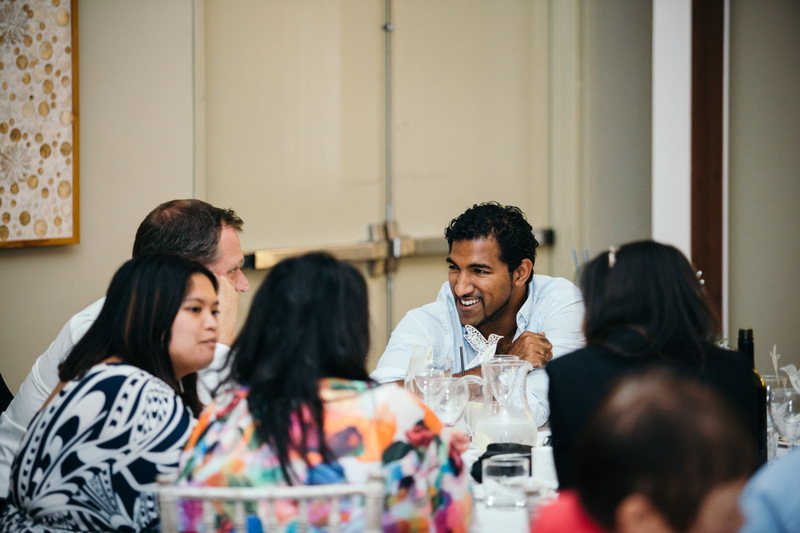 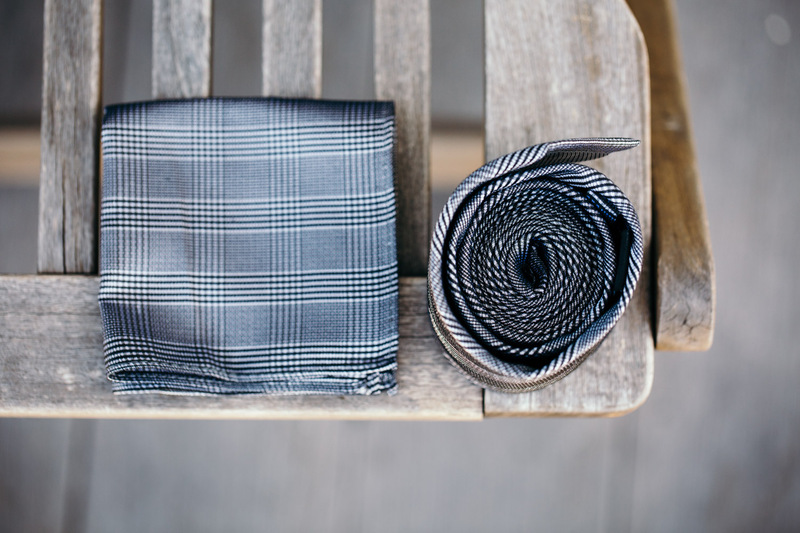 The staff here have excellent attention to detail and were very accommodating. 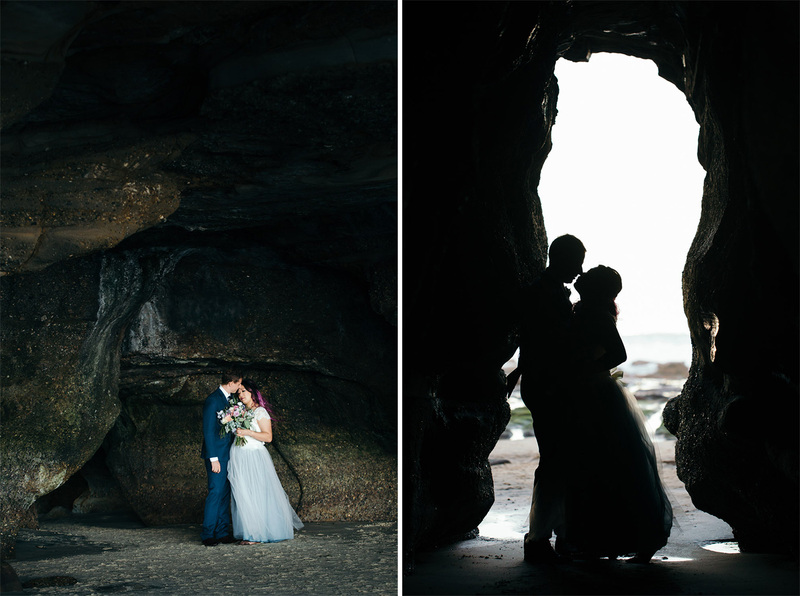 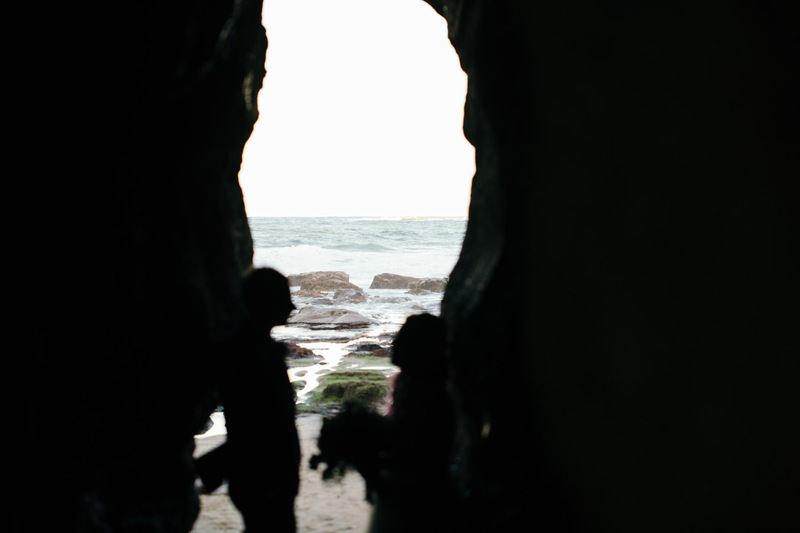 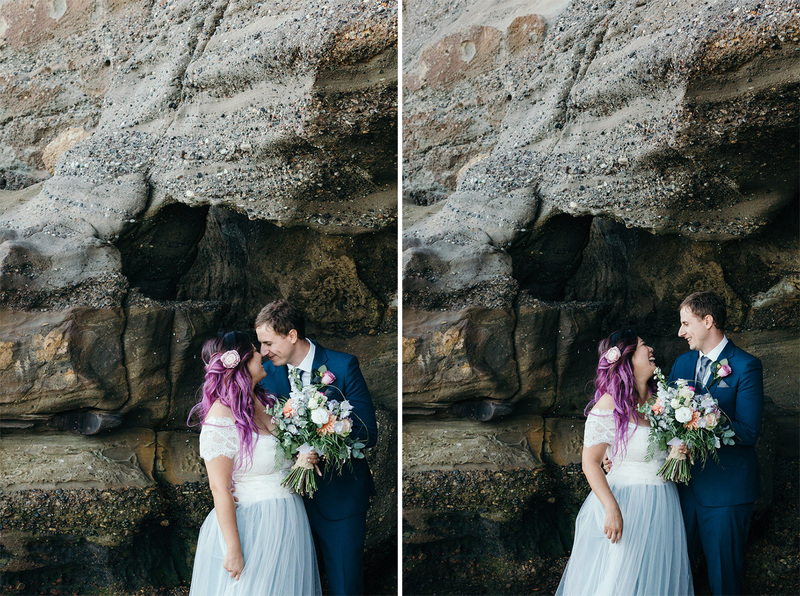 Grace and Jules held their ceremony on the sand, and afterwards, we explored the caves with their bridal party.